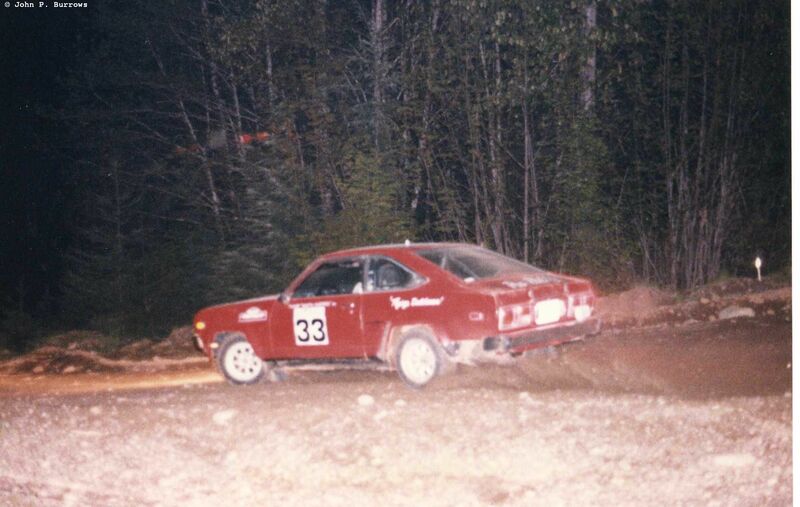 Here is another series of pictures taken by my good friend Denton Morris. 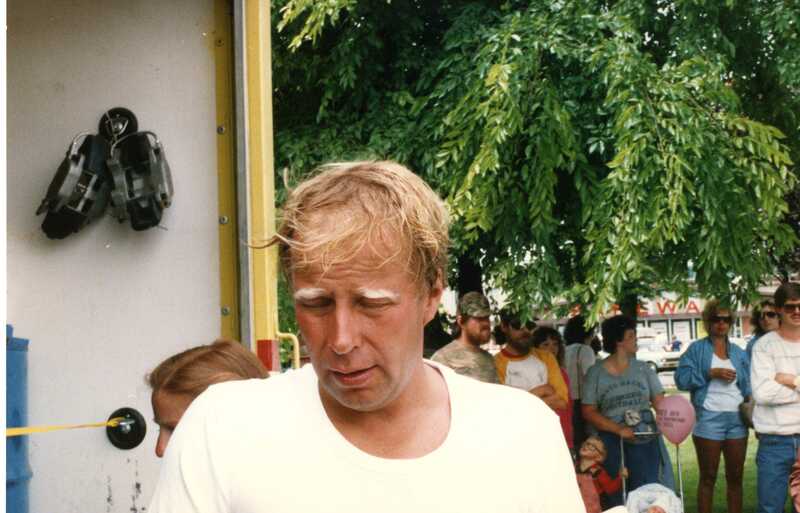 Again, thanks to Denton for graciously scanning his photos and allowing me to post them here. Denton is a professional photographer and you can see his recent work at his website www.dentonmorris.com. The photos below are Denton’s property and he holds all the rights to them, please contact him directly, or me and I will put you in touch, if you wish to reuse them. 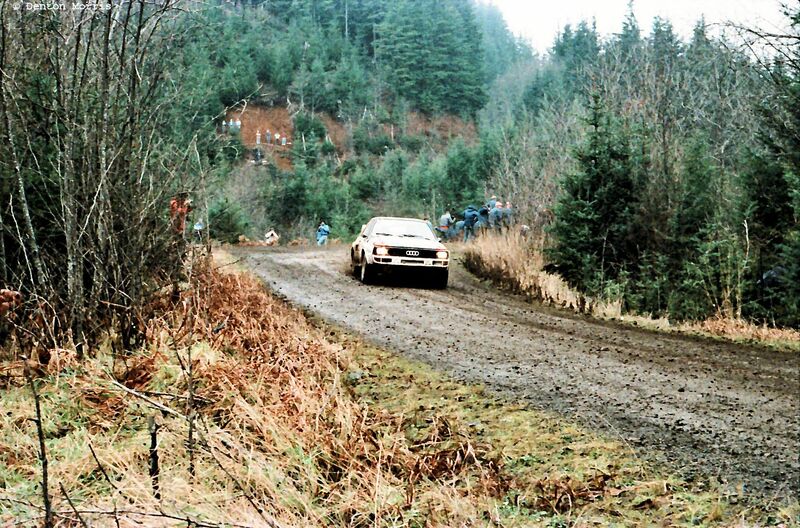 The second day of the rally was held in very typical, wet Northwest weather. 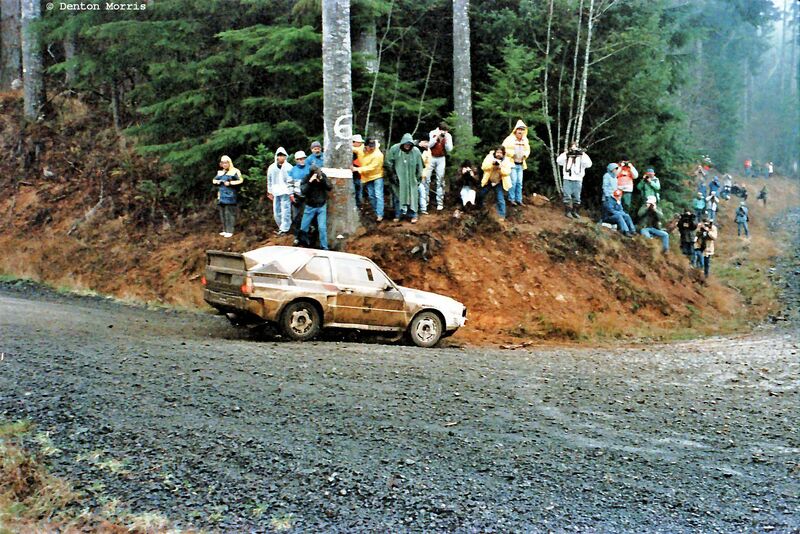 We didn’t leave Seattle for the Olympia area until late morning on the Friday, so we didn’t get to the stages until after lunch. 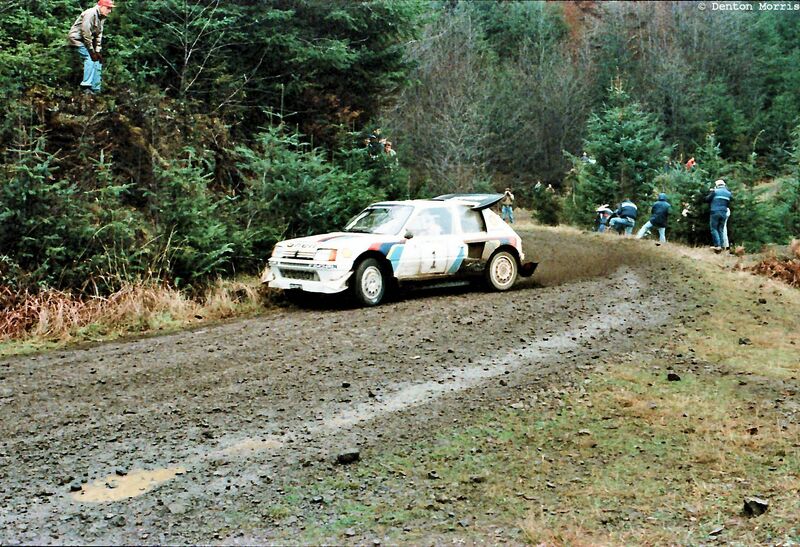 I have long since forgotten the name of this stage, but it had a good hairpin left for photographing the cars at. 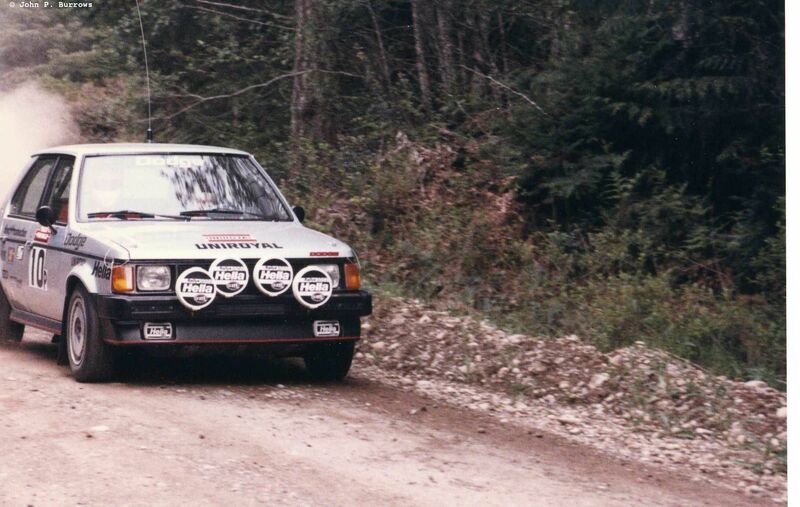 Kankunnen was first through the stage in the 205 T-16. 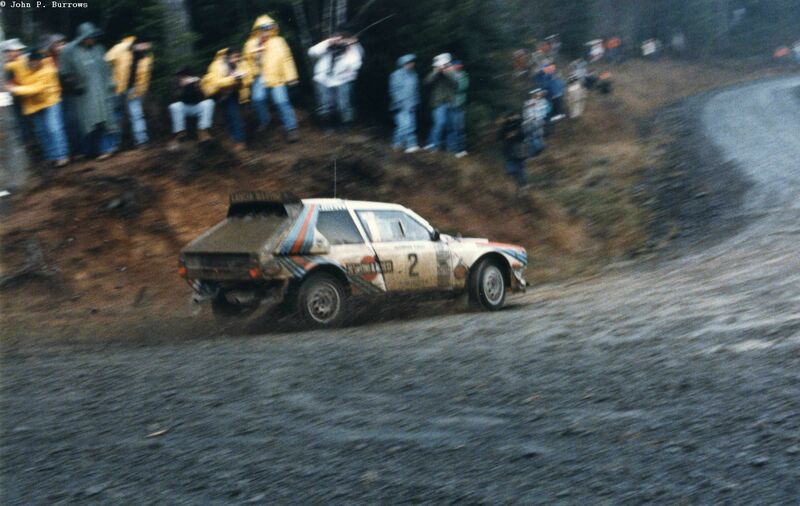 Alen was next through with the Lancia Delta S4. 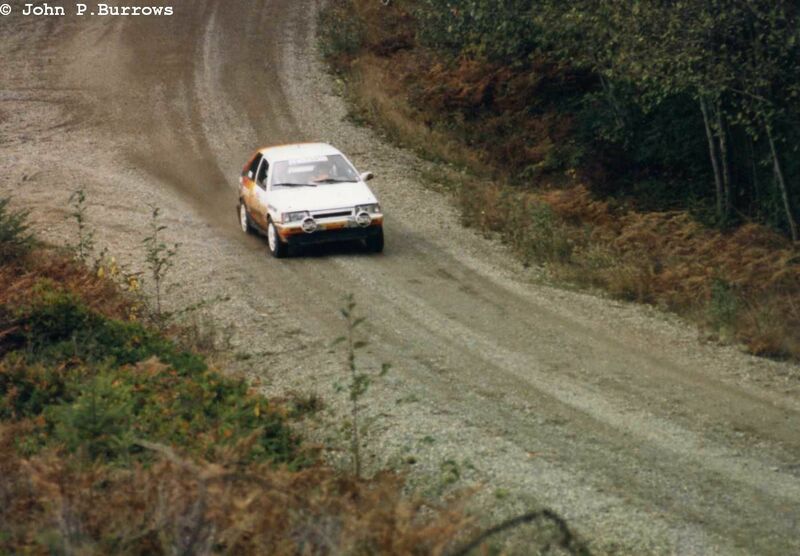 John Buffum in the Sport Quattro. 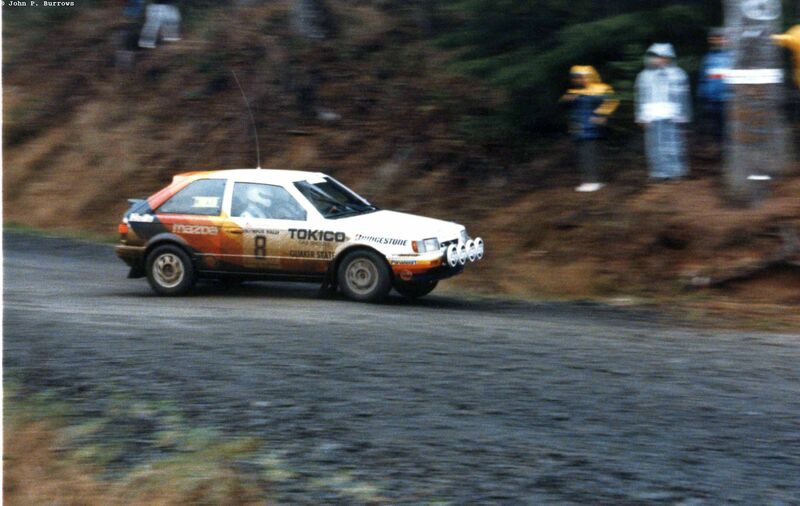 Rod Millen in the Group A Mazda 323 GTX. 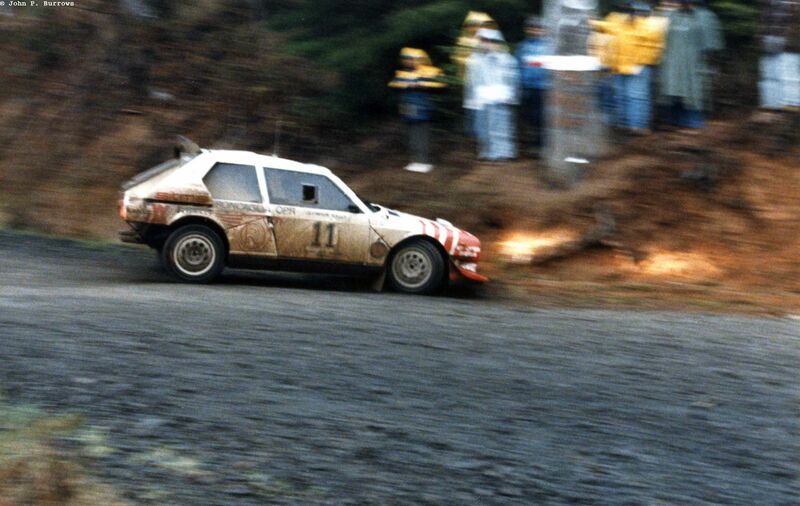 The Alessandrini brothers in their privately entered Delta S4. 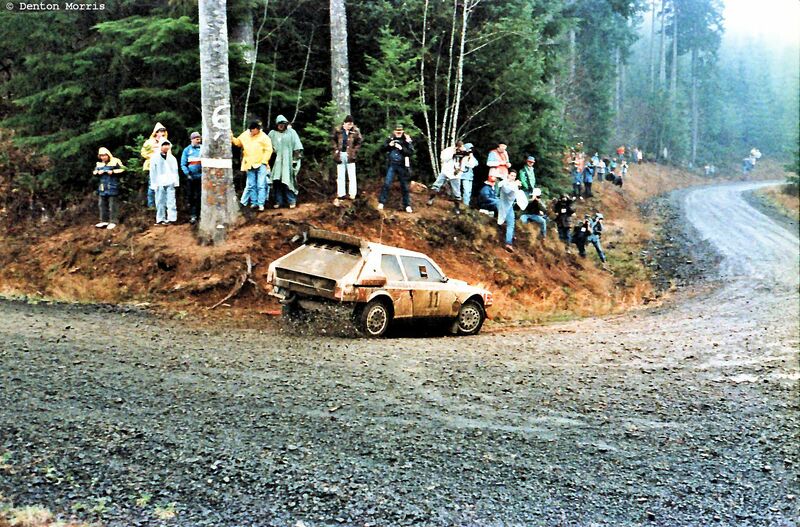 They brushed the bank and the red object behind the left rear wheel is a piece of their air dam. One of the spectators on the hillside jumped down and picked it up as a souvenir. Walter Boyce in the Light Performance Works prepared VW Golf GTI entered by Volkswagen of America. 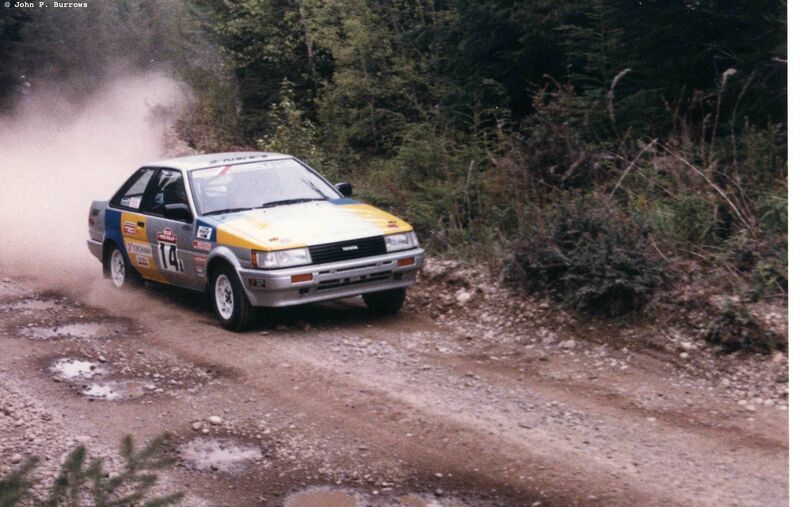 This was the all Japanese team of Kunimasa and Hori in a Toyotal Corolla. 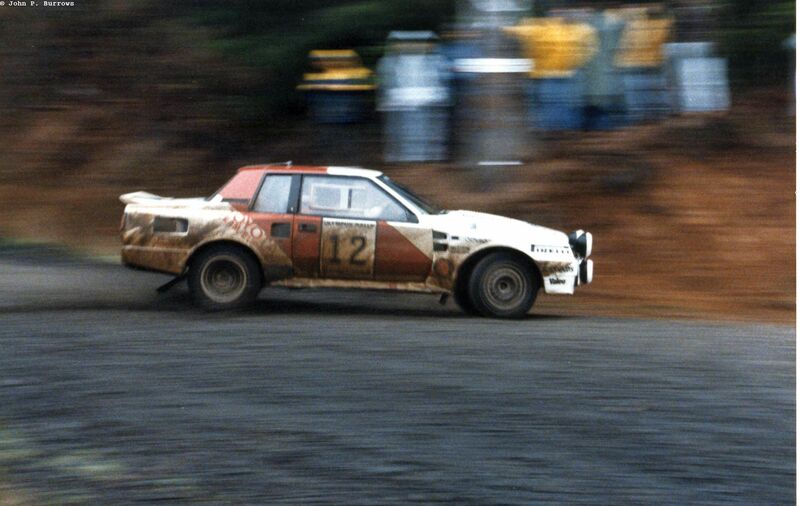 I can’t read the car number on this RX-7, but it may be the local team of Jolly / Sorenson. 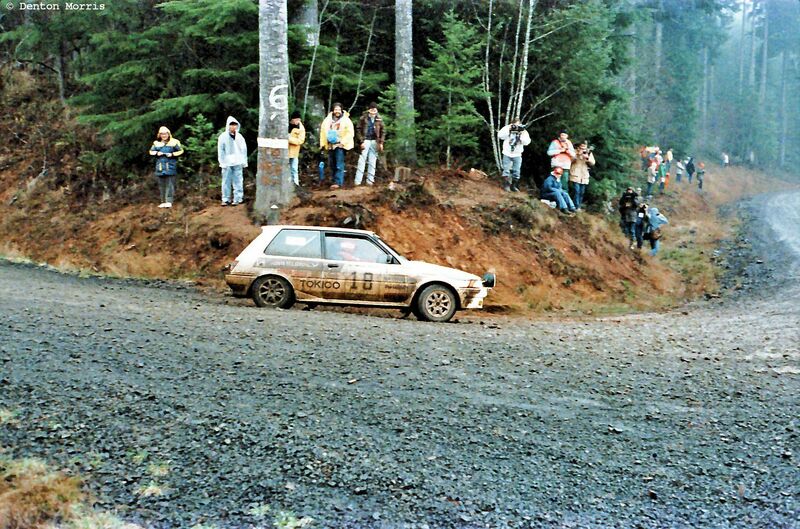 Not sure about who (or what) is passing the Honda CRX of Ray Hocker. 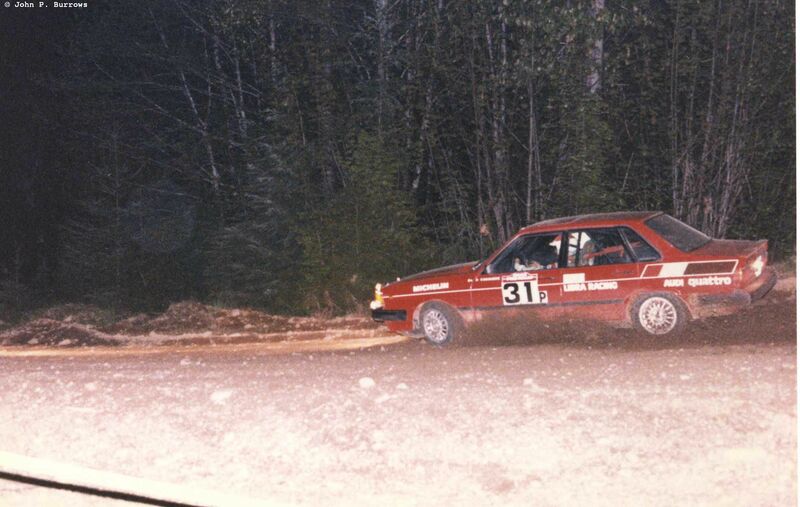 Ray is now an official in the NASA Rallysport organization and also went to High School with my older brother. 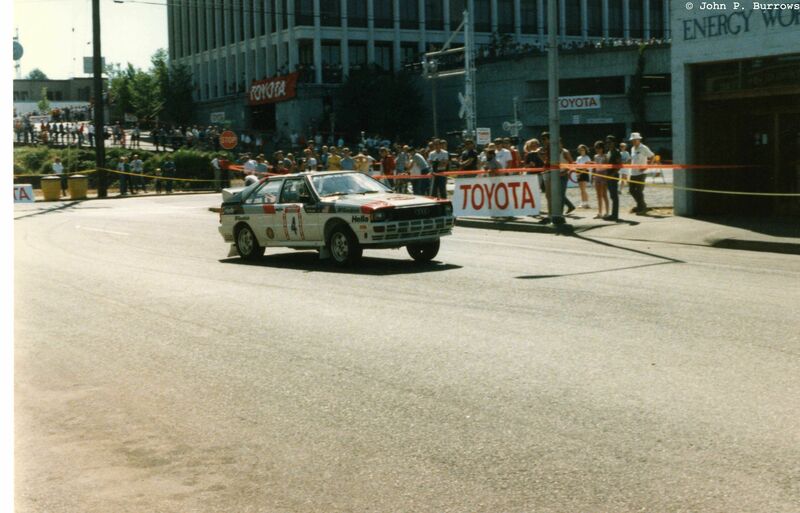 The Toyota of local team Whiting / Damitio. 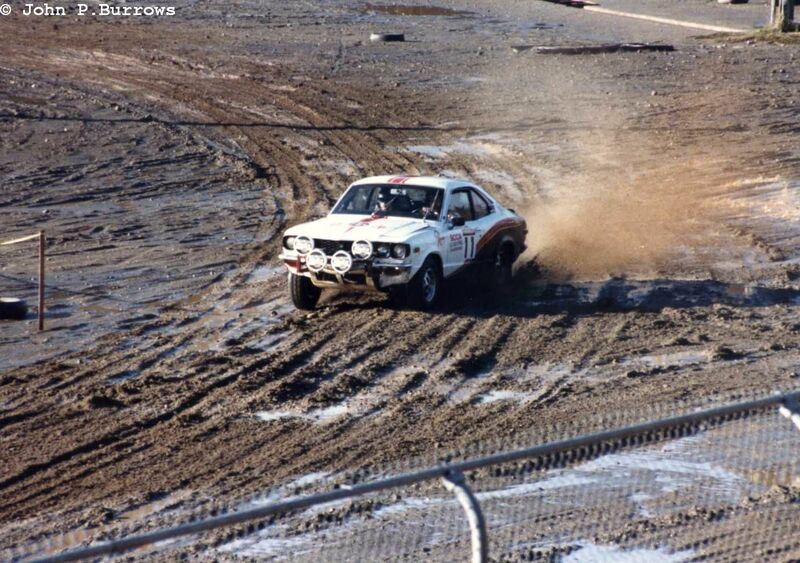 They usually run a Mazda RX-3. 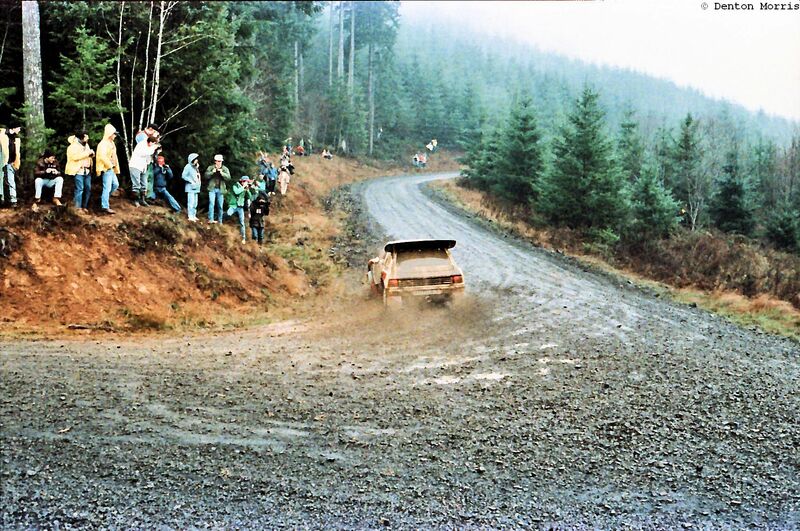 Later on in the day things began to dry out. 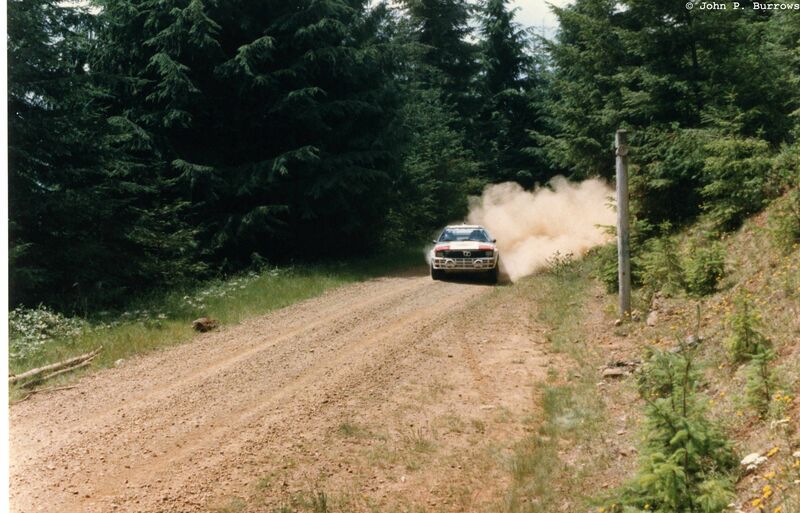 I don’t remember the name of this stage either, but I do remember Alen nailed me in the back with a rock. 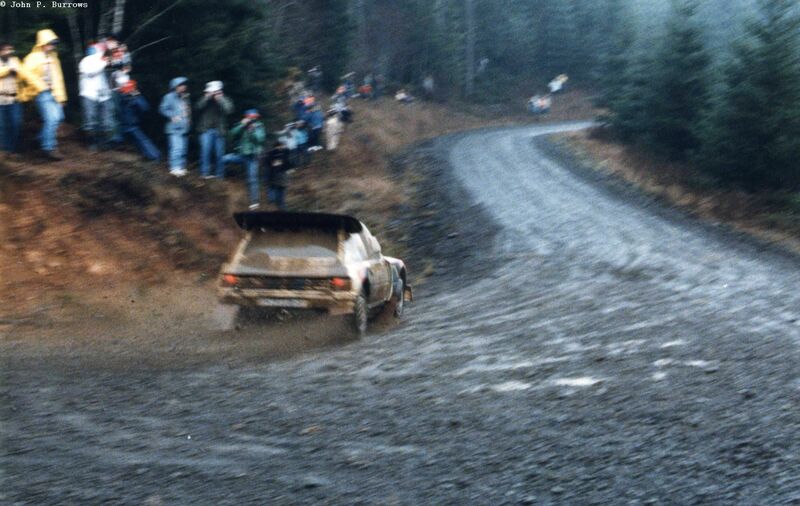 Kankunnen is first through the stage. 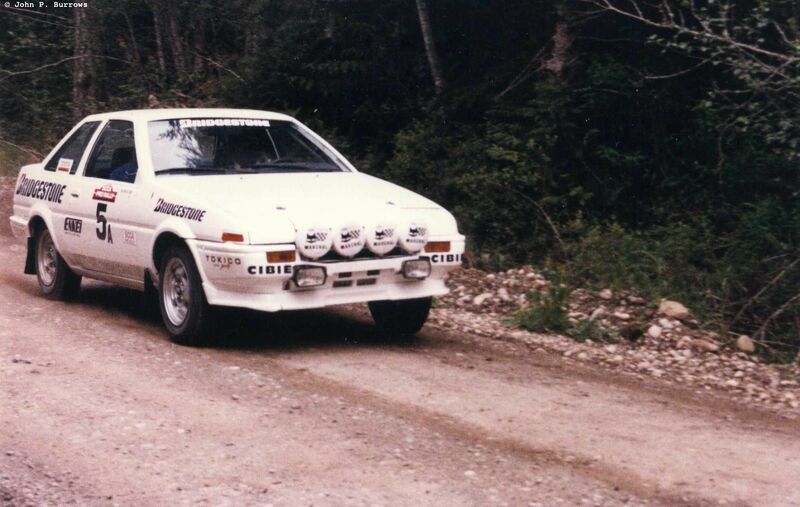 One of the TTE Celica Turbos. 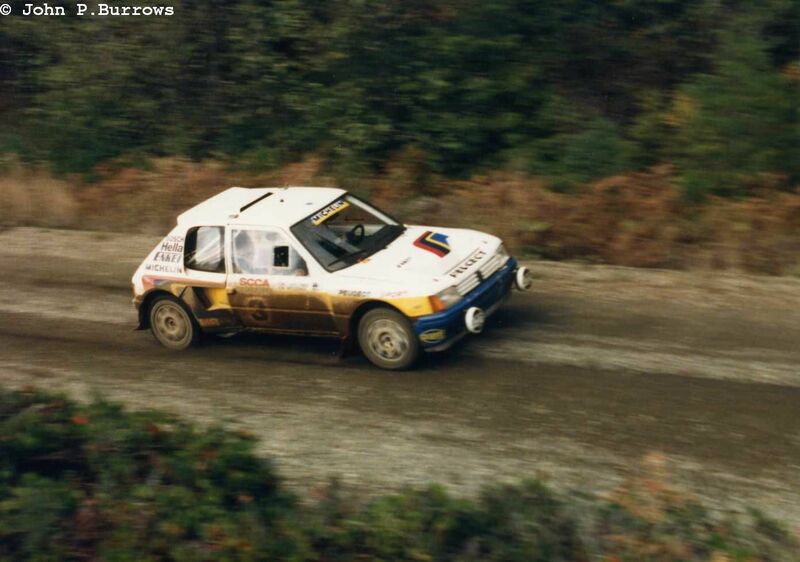 In 1986 the Olympus gained World Rally Championship status and would be held in early December. 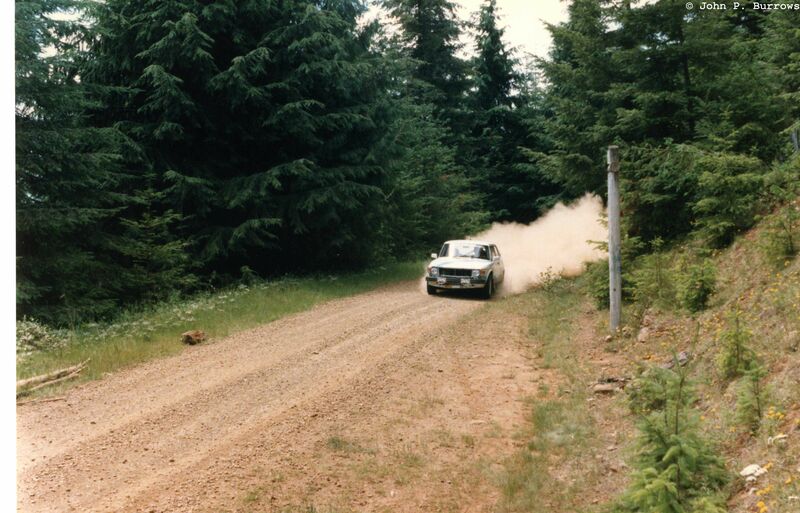 The Rallyweek Northwest organizers decided not to do a Rallyweek Northwest in April, but instead just ran the Nor’wester SCCA National Pro Rally in May as a shakedown for the Olympus. 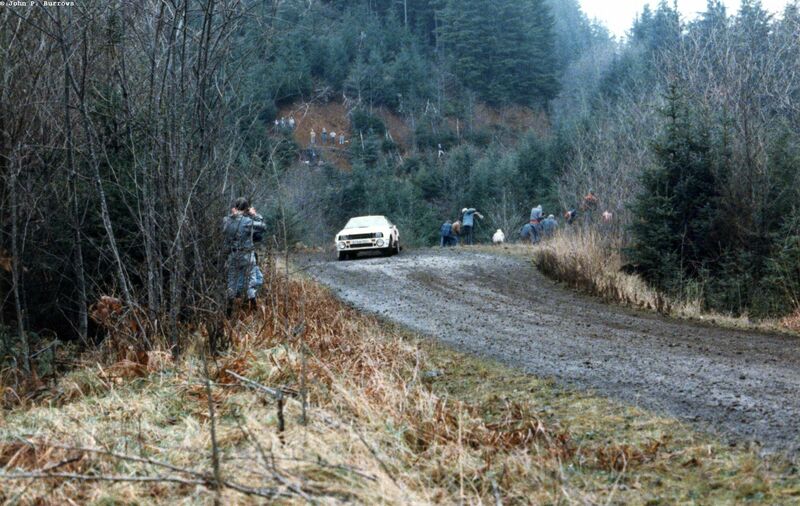 As usual, the rally was based in Tumwater, WA and used the familiar stages in the nearby Capitol Forest. 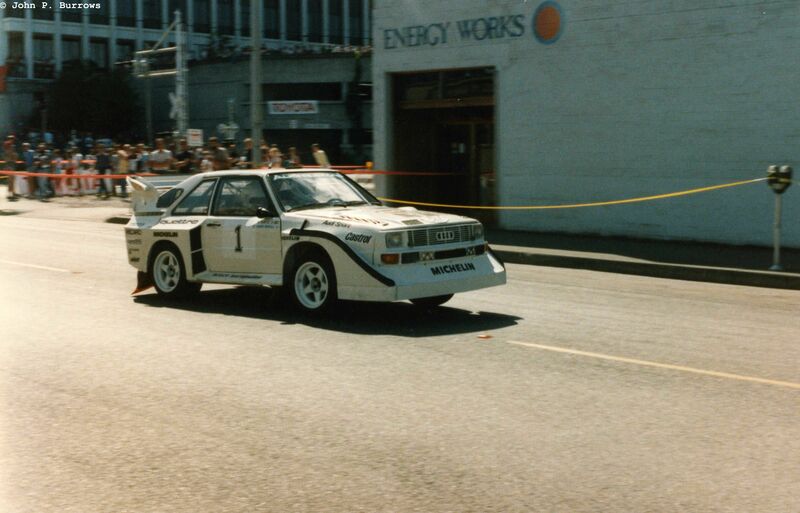 However, there were no city street stages as in rallies past. 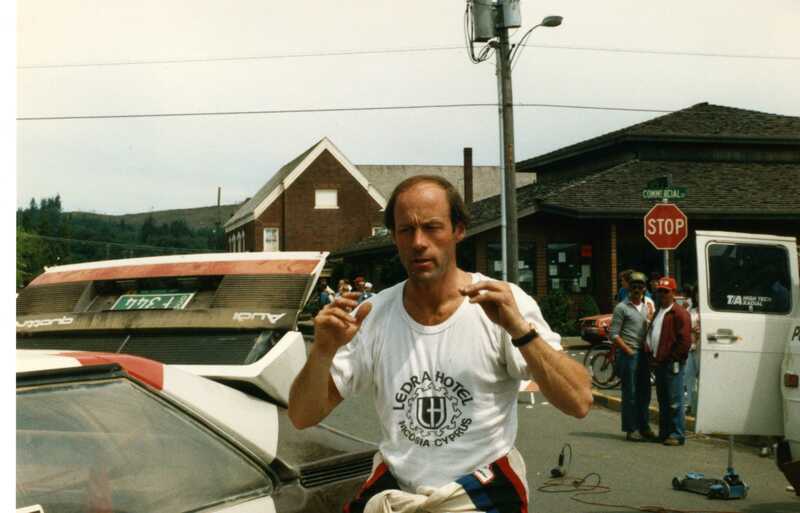 Doug Shepherd was running his Dodge Shelby in GT class. 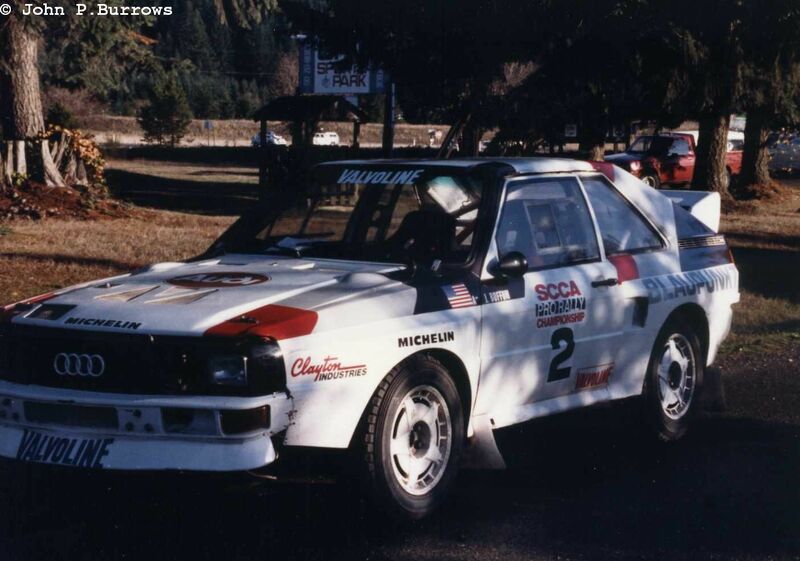 New Zealander Clive Smith was running a Toyota in Group A. 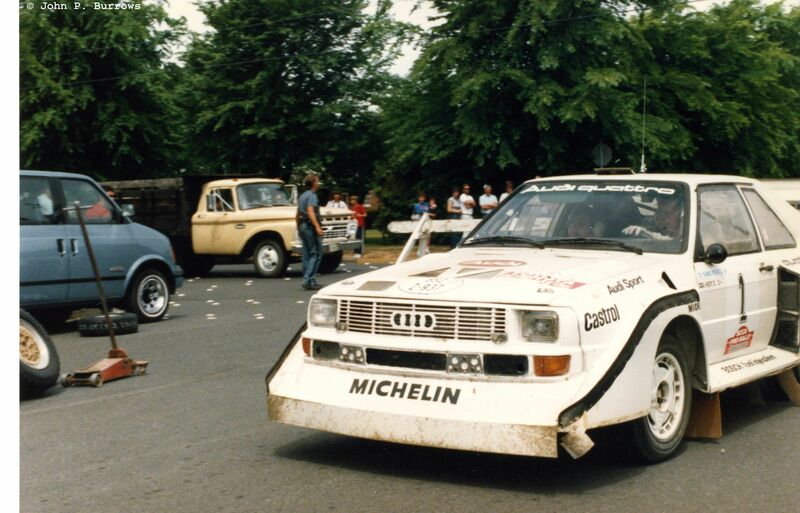 Group A Audi entered by Carter/Kingsley. 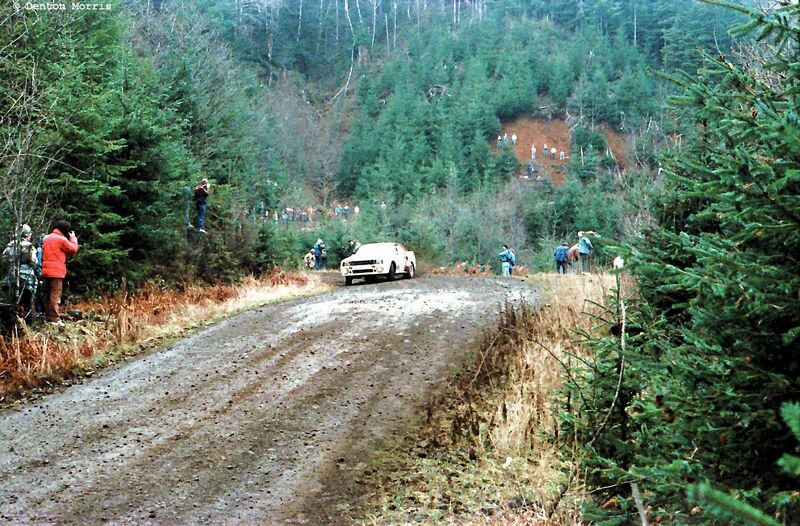 They DNF’d later. 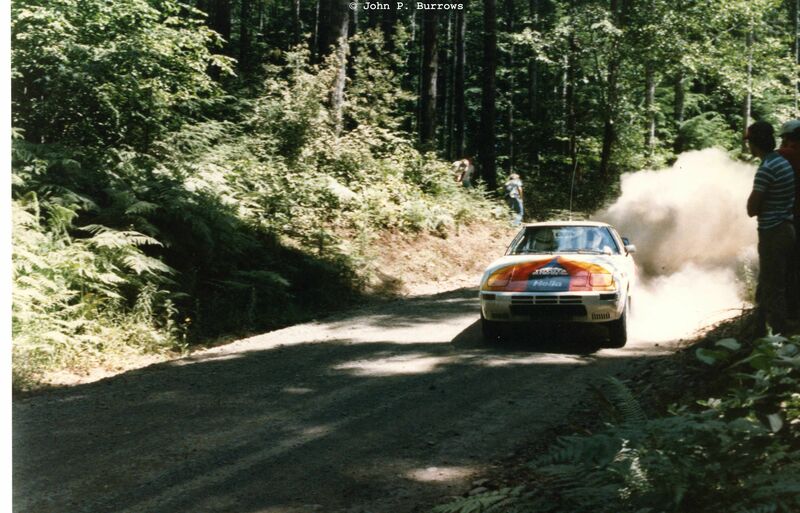 Dodge Shelby GLH of Landau/Landau running in the Production class. 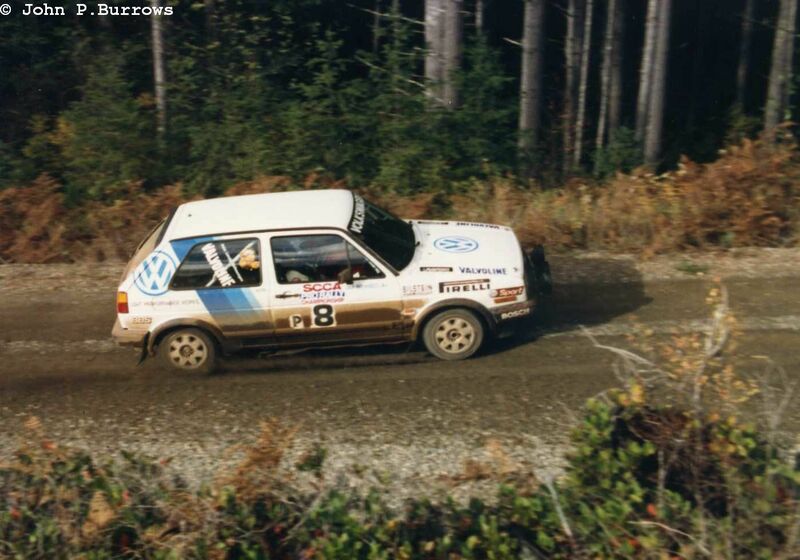 Another Dodge Omni GLH driven by the team of Crawford & Andreini. 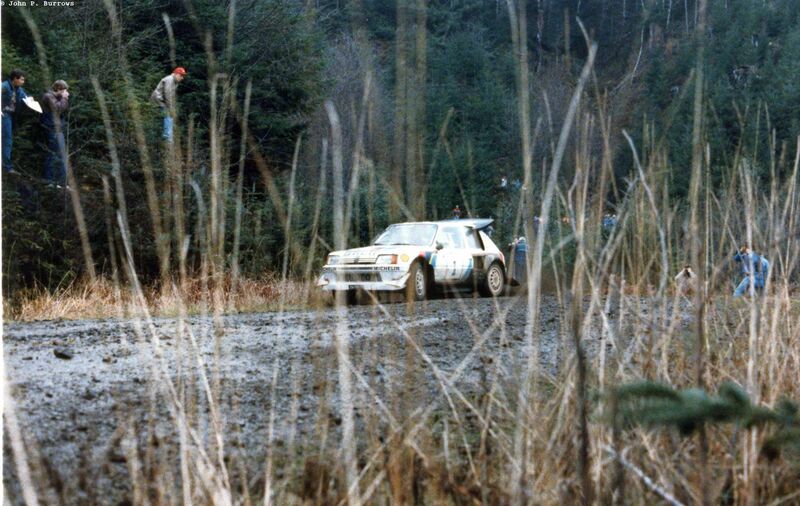 The Wantanabe brothers in their Group A Toyota. Shepherd and Reese at night. 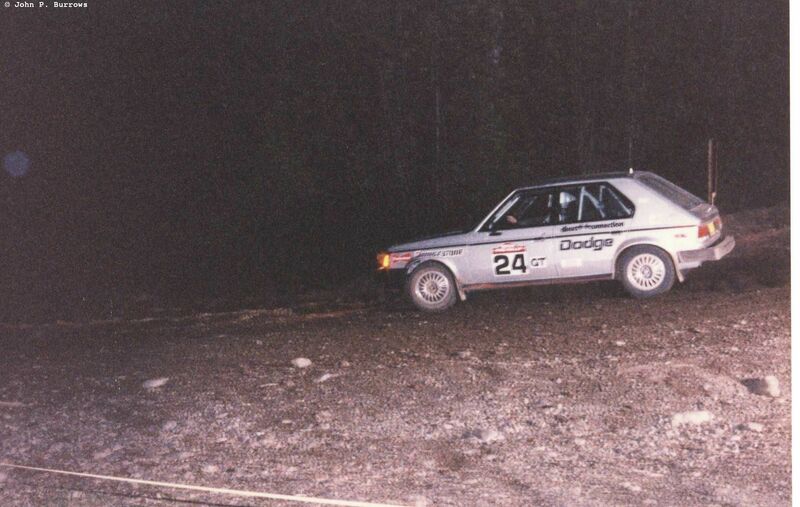 Another Dodge running in the GT class. 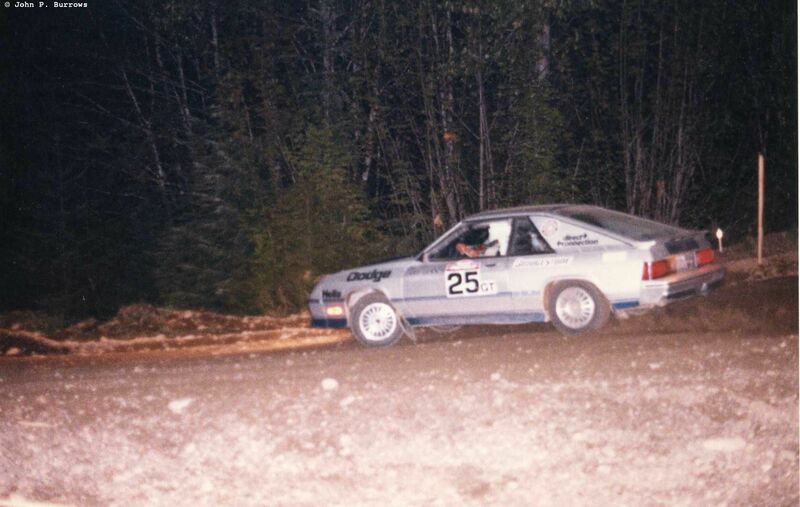 The Gooches in their GT class Dodge. 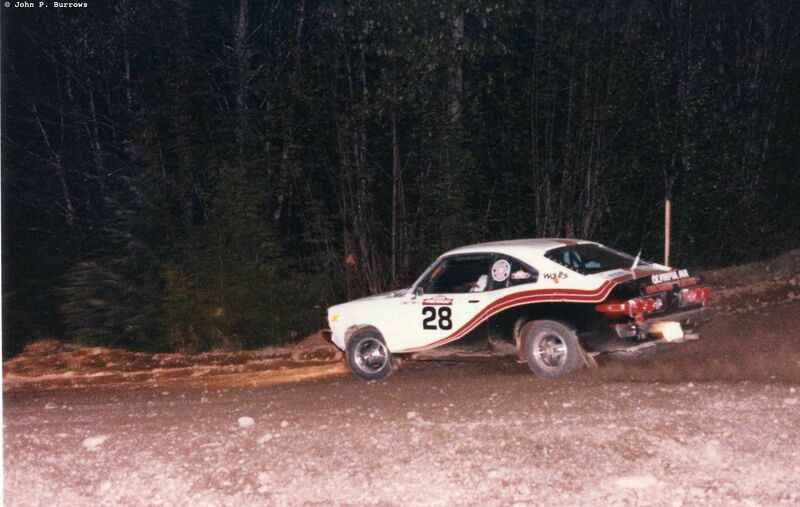 Local crew of Grant Whiting and Ray Damitio in their Mazda RX-3. They were sponsored by Walt’s Radiator of Olympia. 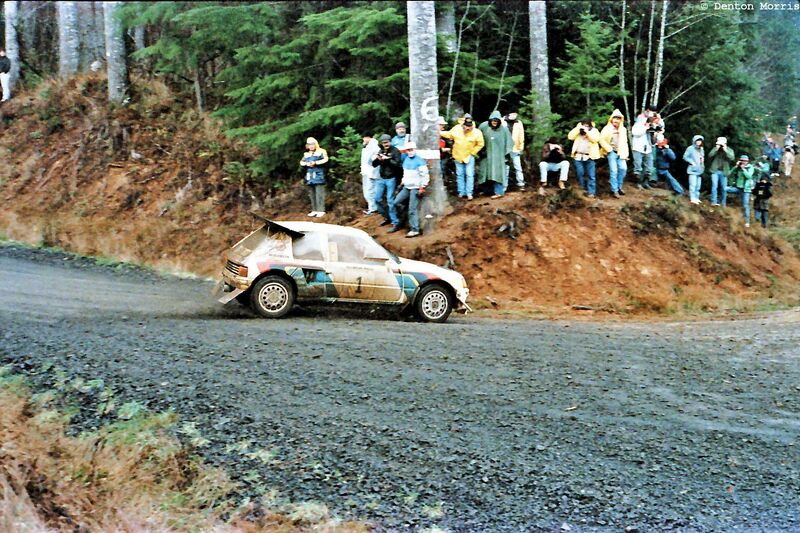 I always liked the color scheme of this car. 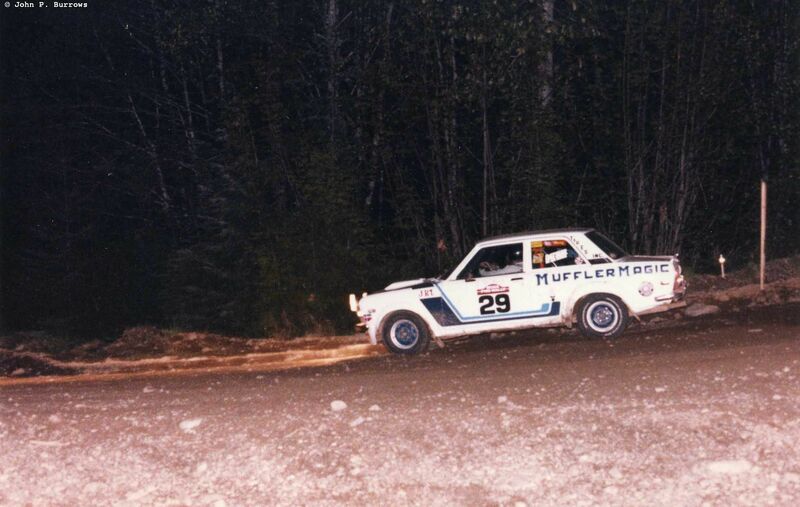 Local Gene McCullough in a Datsun 510. 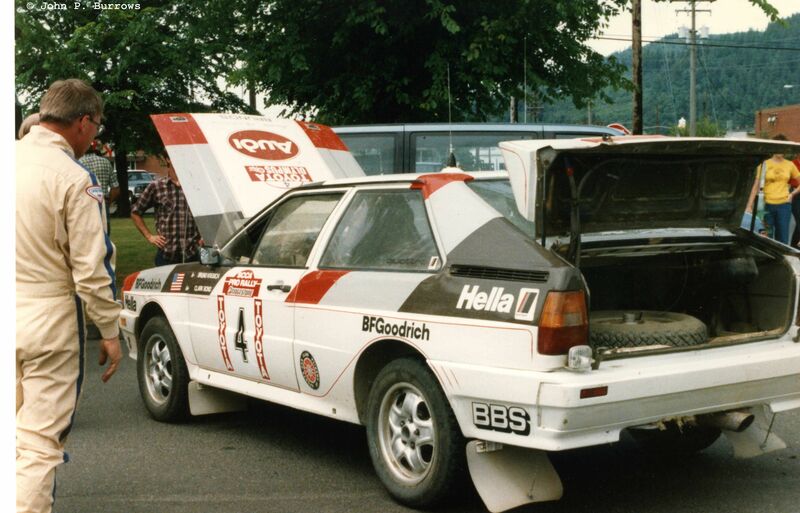 John Buffum’s stepson Paul Choiniere was running an Audi 80 in Production. 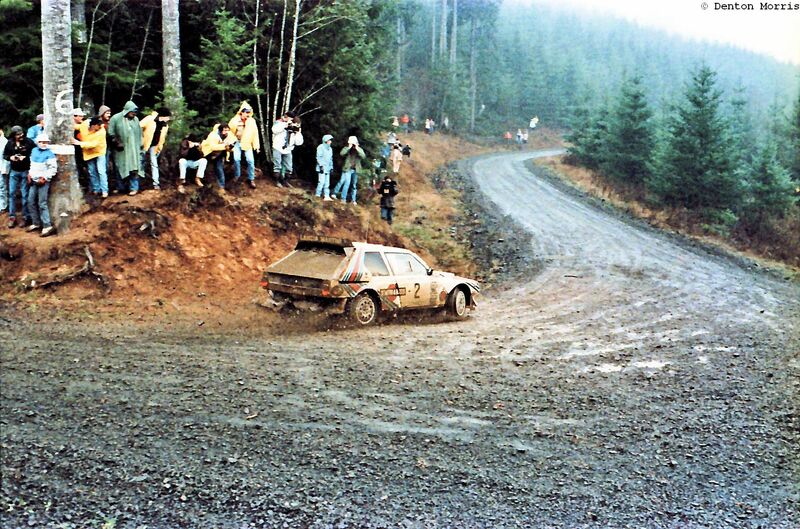 Another Datsun. I can’t seem to find any information on the crew. 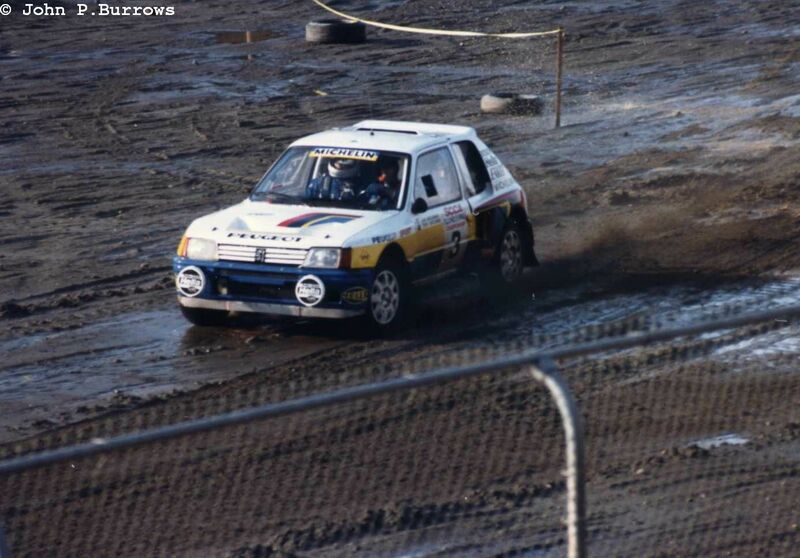 Jon Woodner had finally gotten his Peugeot 205 T-16. 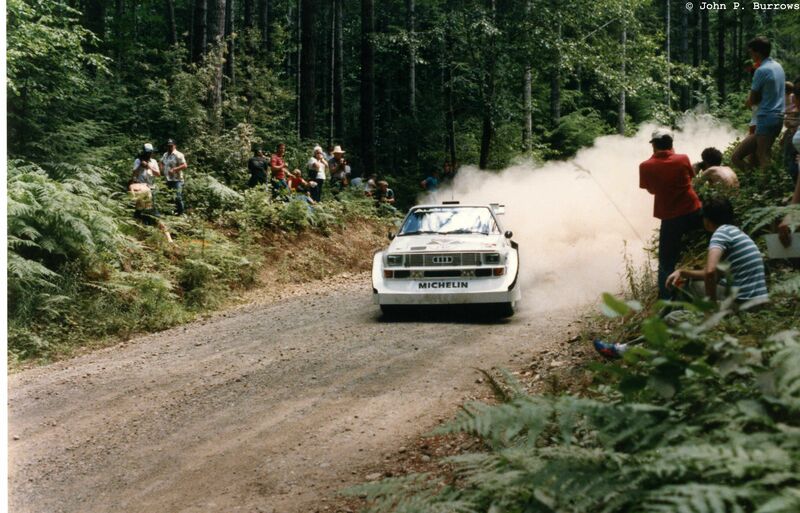 The car started as a street 205 built for Group B homologation. 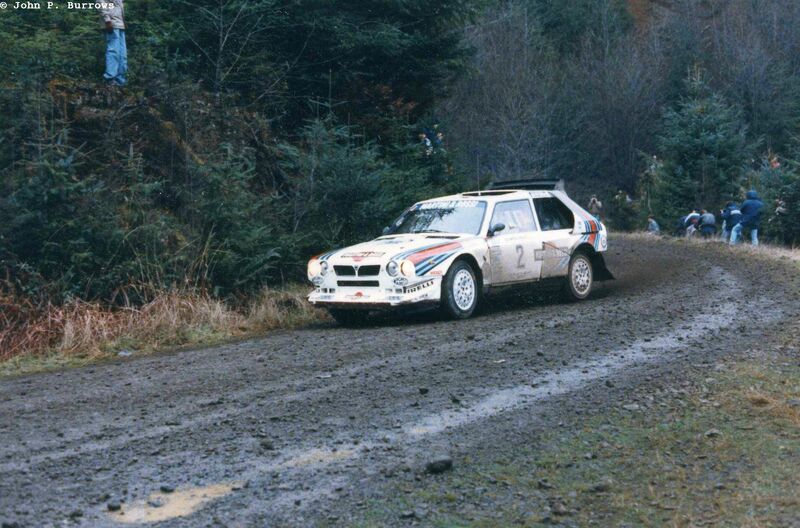 Jon had it modified in the UK since the French wouldn’t sell him an ex-works car. 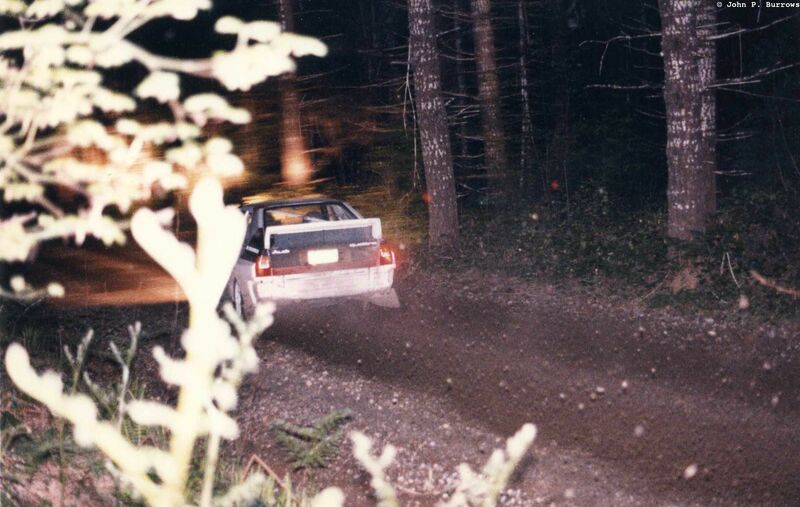 Here it is at night service probably in Shelton, WA. 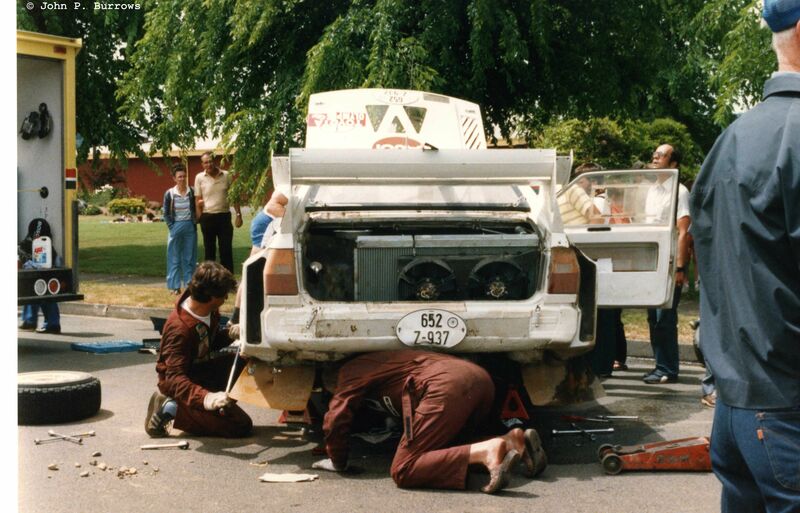 After being housed in a collection by Jon’s widow for many years, the car was sold and is now in England and has been fitted with an Evolution 2 body kit and is active on the historic Group B rally circuit. 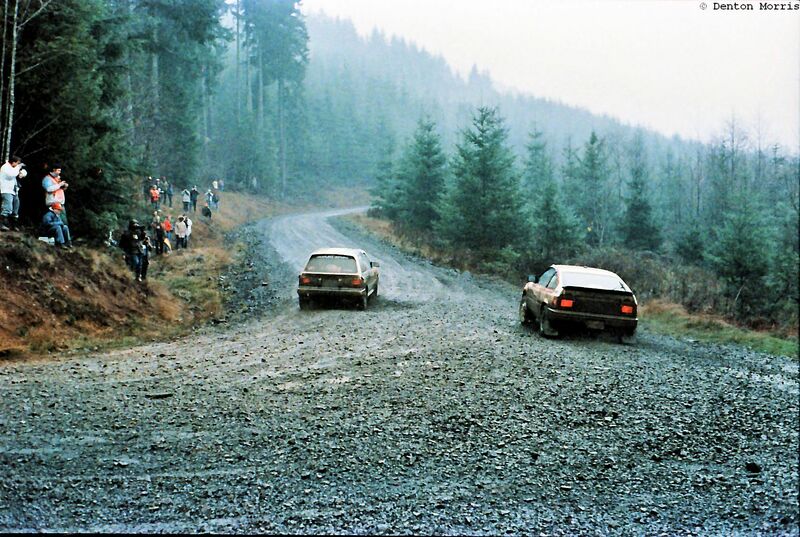 Around 1982 or 1983 the organizers of the Olympus rally decided to work toward getting the rally included as a round in the World Rally Championship. 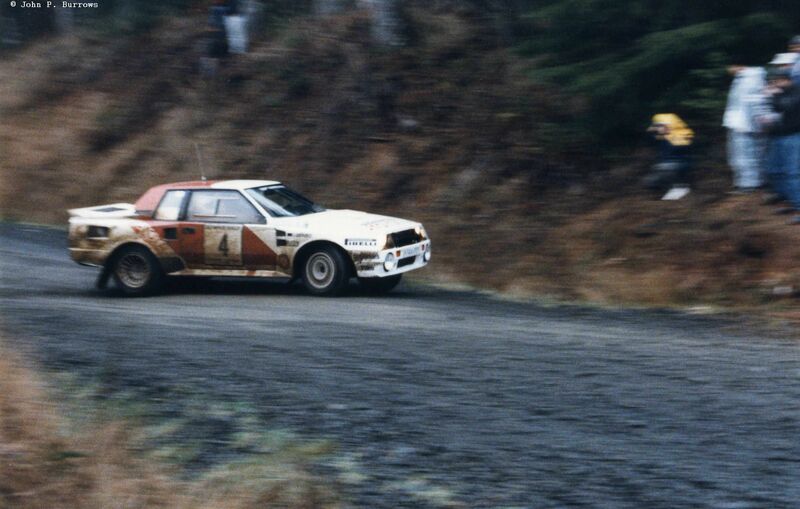 In 1983 and 1984 they moved the Norwester and Olympus to consecutive weekends in April as Rally Week Northwest. 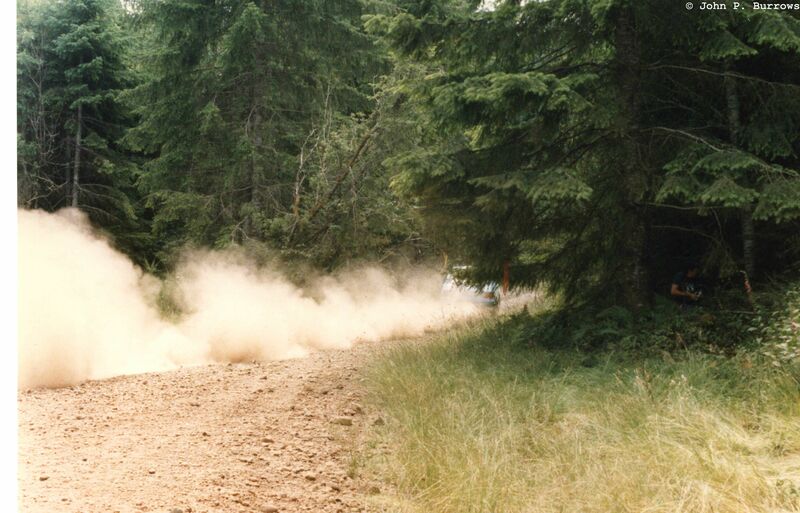 In 1985 the Olympus Rally moved to the 4th of July weekend as an FIA observed WRC prototype event with the possibility of becoming a round of the WRC in a subsequent year. 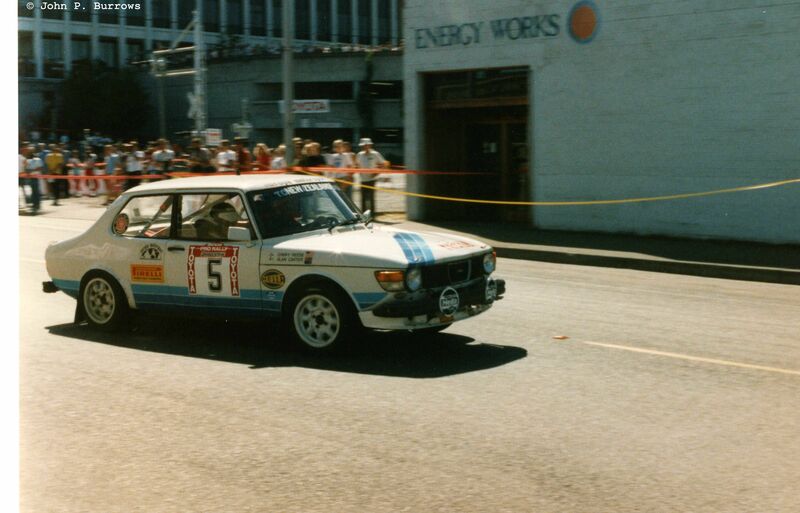 That year the Olympus ran to WRC rules, however SCCA open class cars were also allowed to compete. 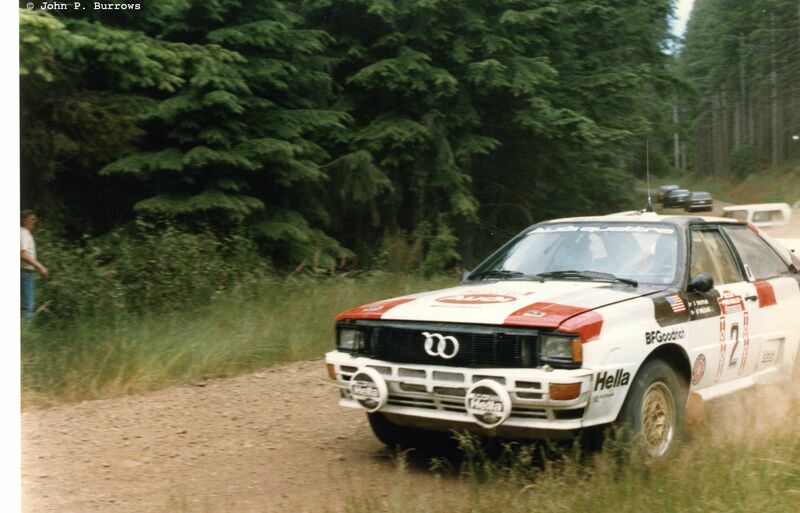 The works Audi team, Audi Sport sent a brand new Quattro S1 to make its competition debut with Hannu Mikkola and Arne Hertz. 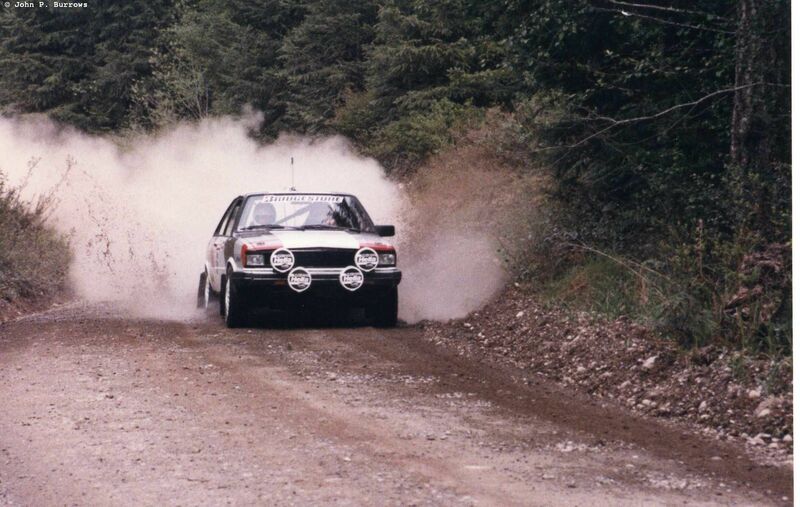 No doubt shaking it down prior to its WRC debut on Rally Argentina. 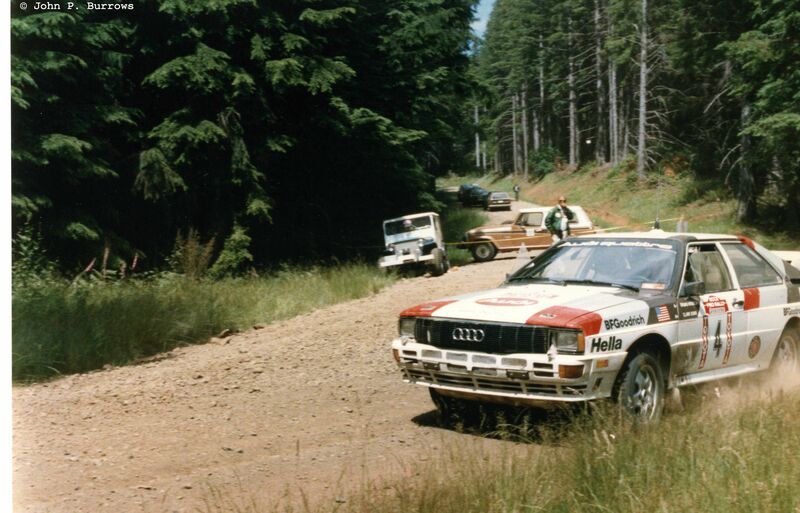 Plus Audi and Mikkola/Hertz could gain some early knowledge of the event prior to inclusion on the calendar and already have some pace notes that have been run at speed. 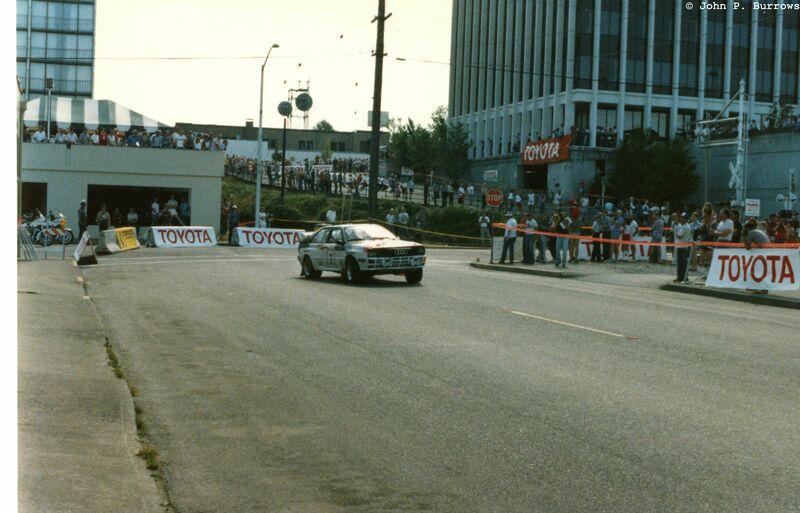 The first stage of the Olympus had traditionally been held in downtown Olympia for the past two years. 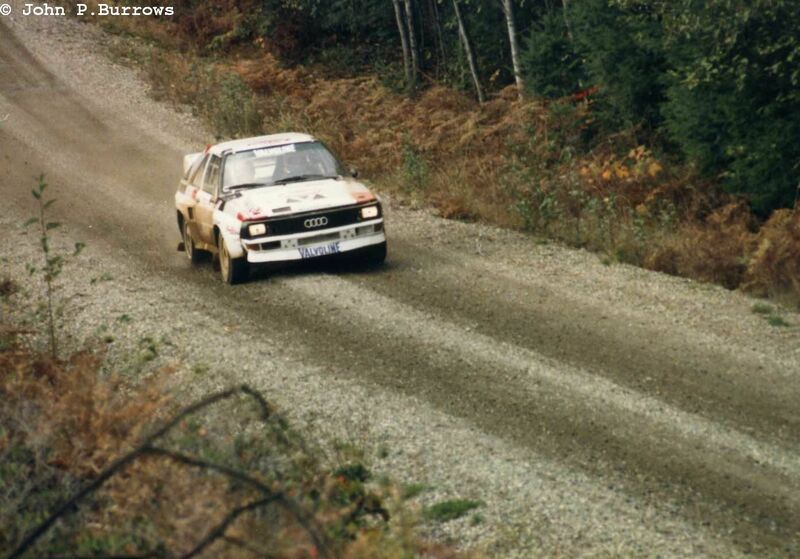 Mikkola/Hertz in the spectacular S1 Quattro. 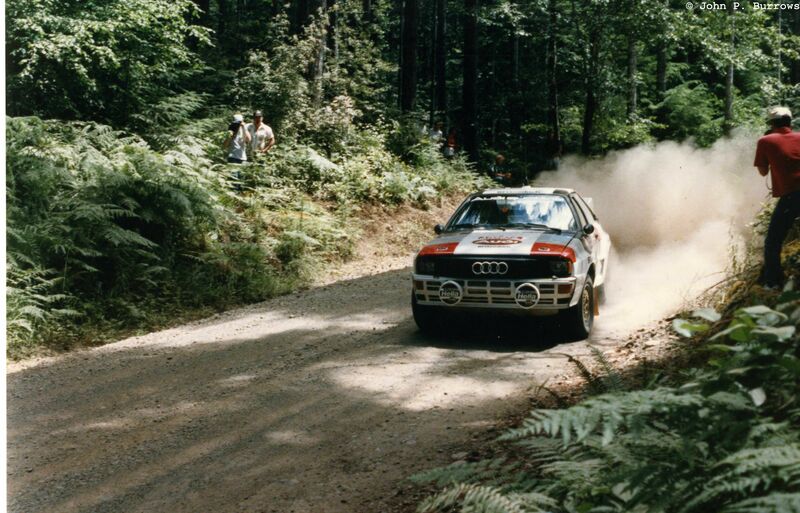 John Buffum was next in his A1 Quattro. 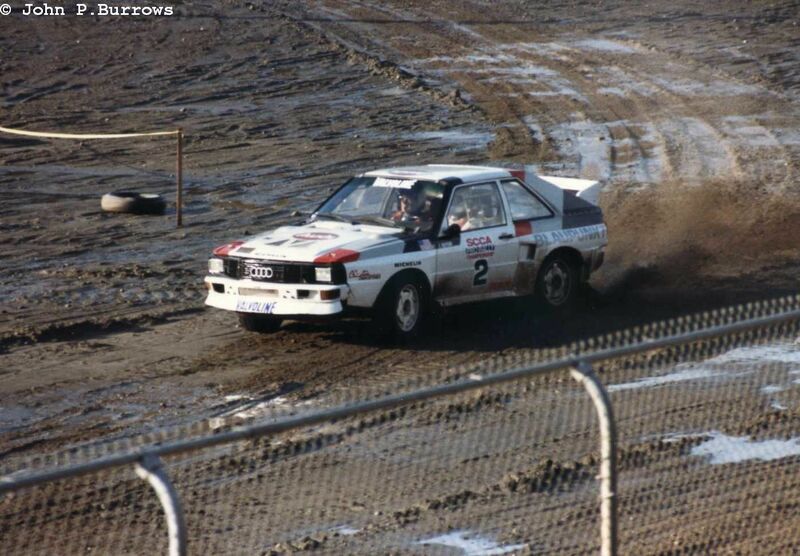 Bruno Kreibich in his ex-Buffum Group 4 Quattro. 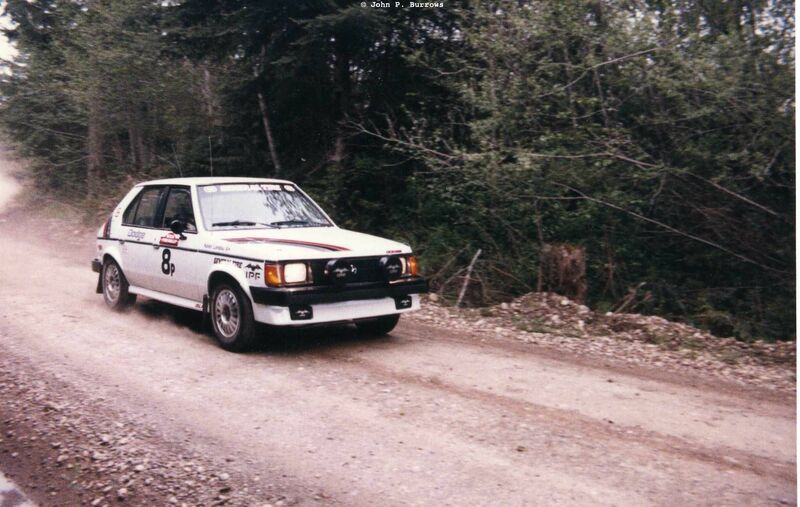 I think this is the one that Mouton won the ’82 Port Wine Rally in. 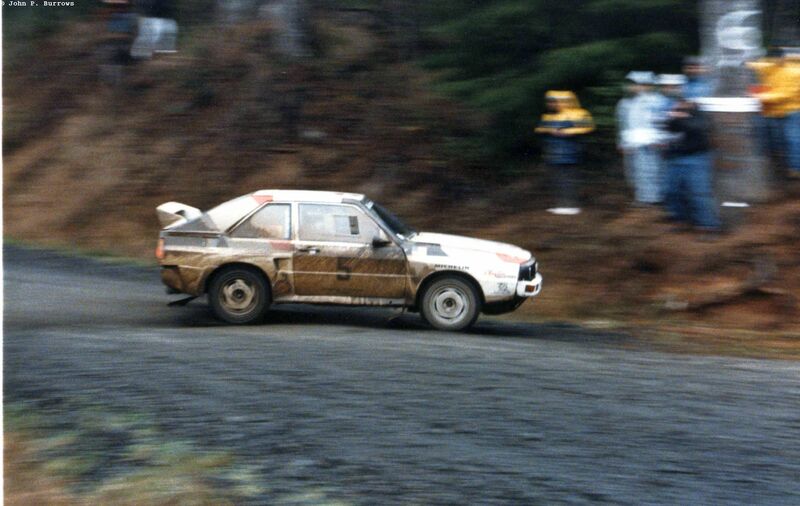 Kiwi Alan Carter in a Saab. 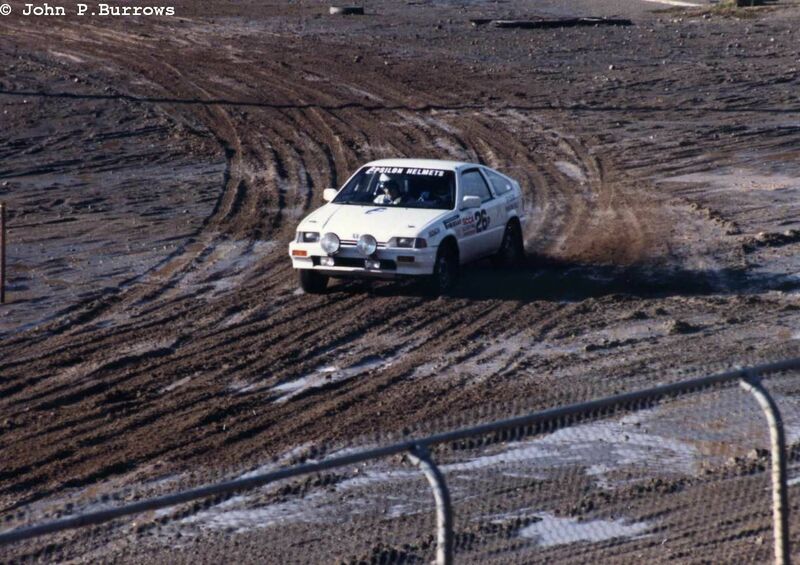 Rod Millen in his AWD RX-7, built in his Newport, CA shop. 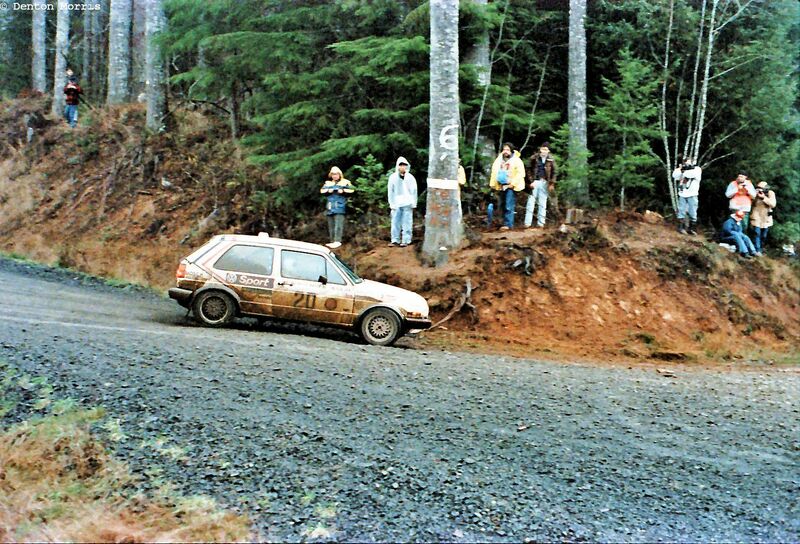 These next few shots of the leading trio of Mikkola, Buffum and Millen are from the Taylor Town stage just outside of Shelton, WA. 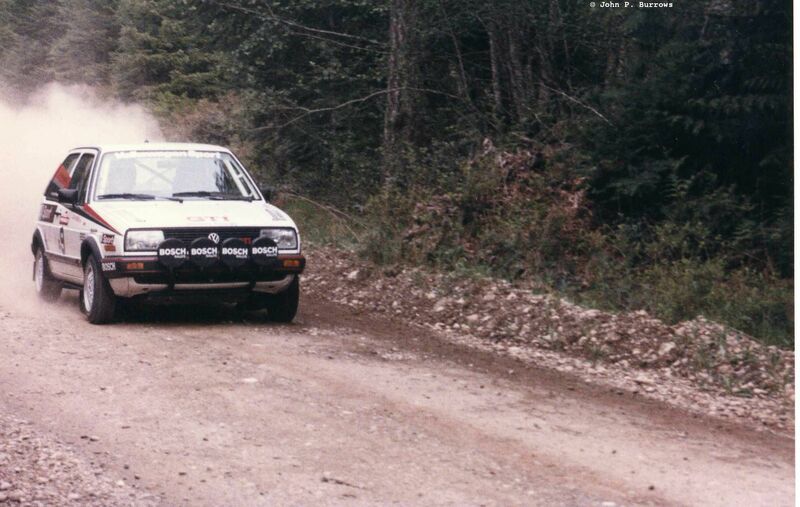 Jon Woodner was at the Olympus with a new Peugeot 505 to replace his aged 504. Here he is on the Taylor Town stage. 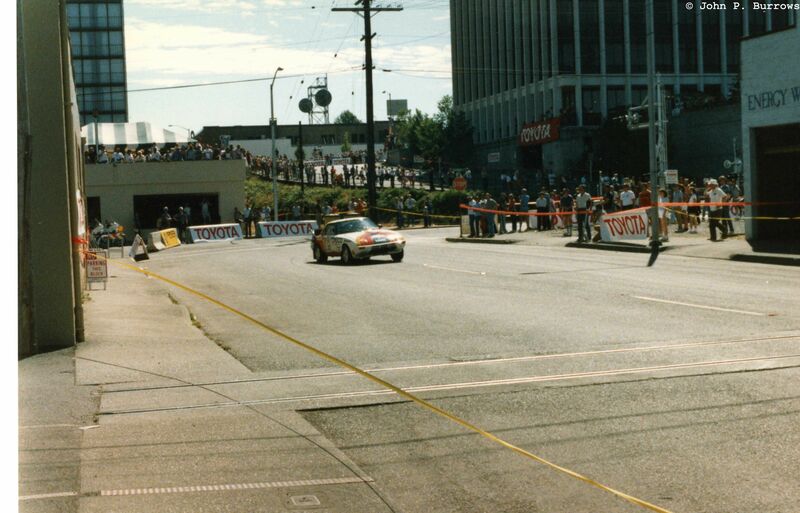 Another RX-7 on the long straight on Taylor Town. 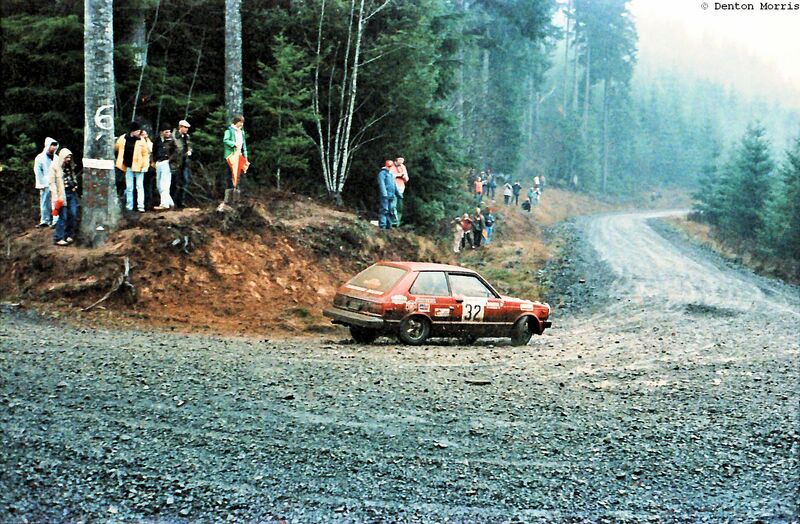 I forget the specifics of this stage. 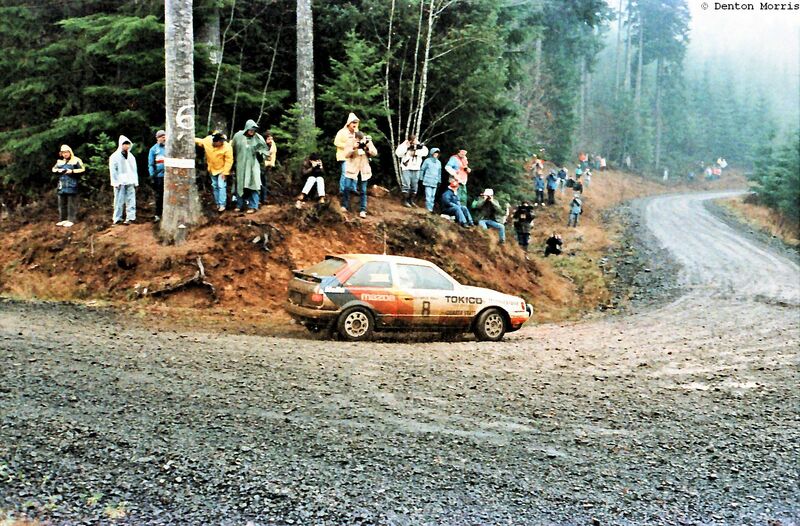 It’s a typical Capitol Forest stage though. 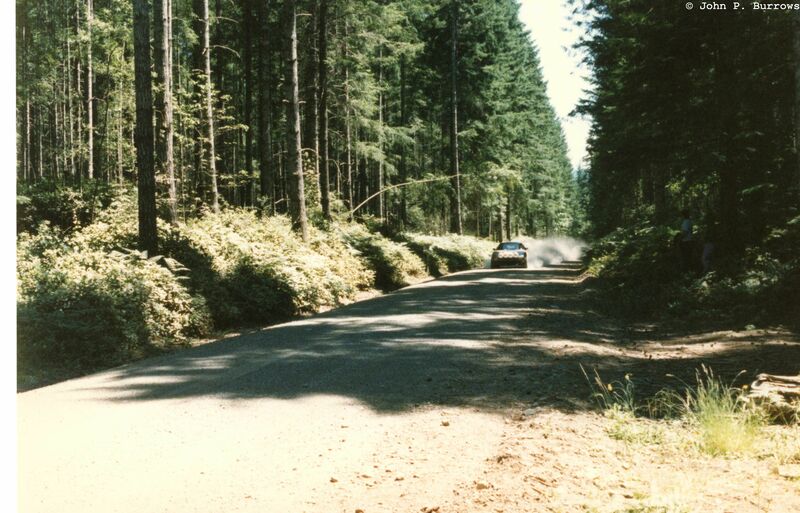 Another Capitol Forest stage. 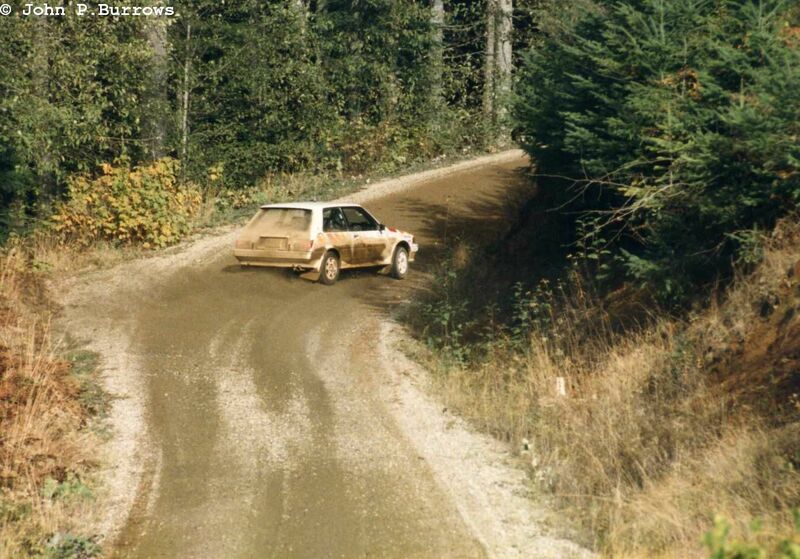 Check out the Jeepster in the background. 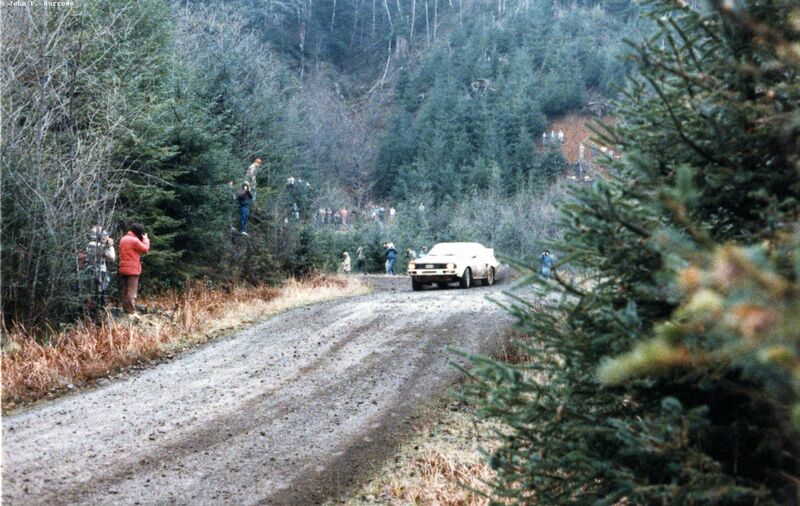 The Jeep club was working crowd control and radio at this stage. 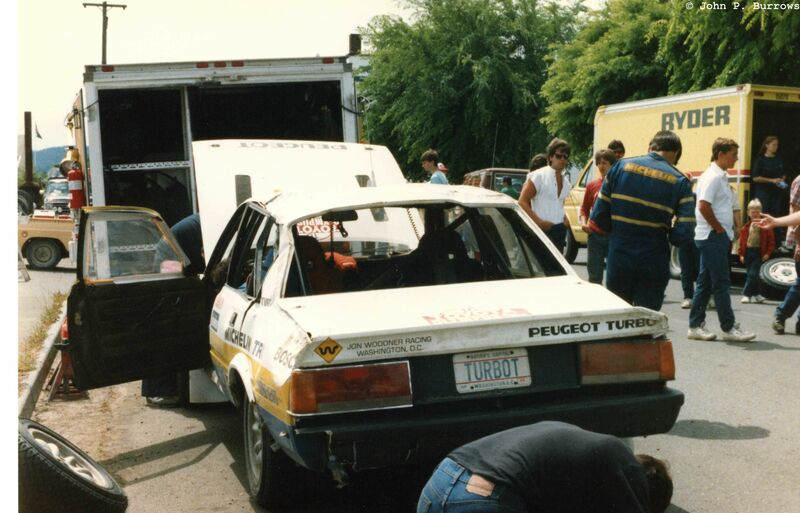 Rod Millen rolled his Rx-7. 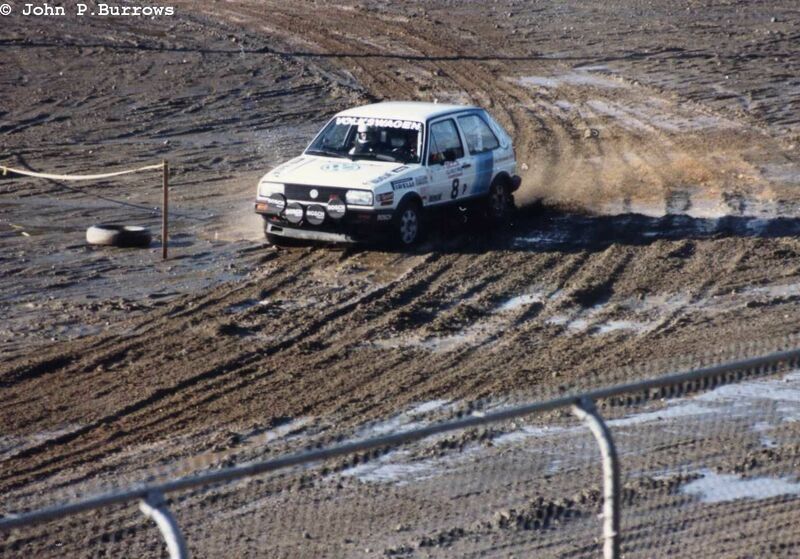 You can see the surround around the rear oil cooler is missing. 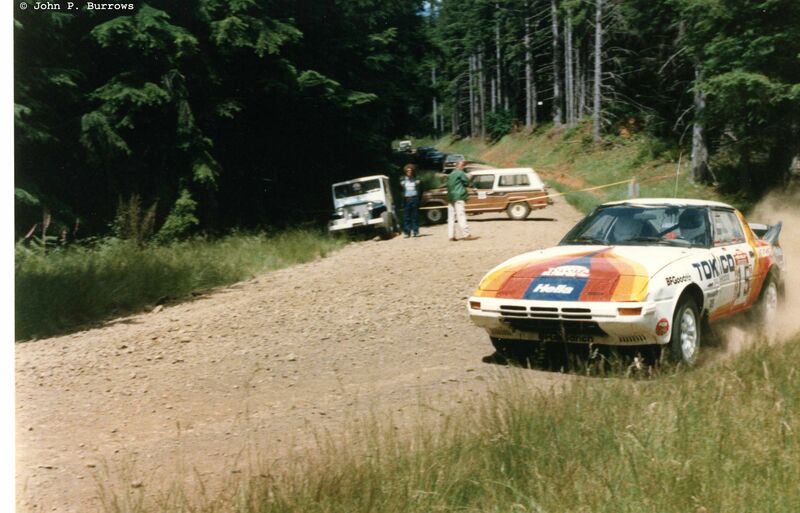 The first service halt was in Elma, WA. 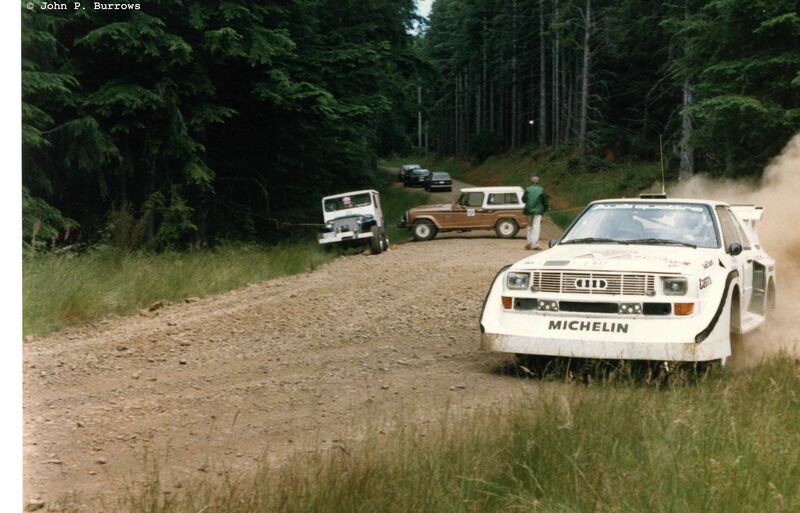 The S1 E2 getting service from the works Audi team. 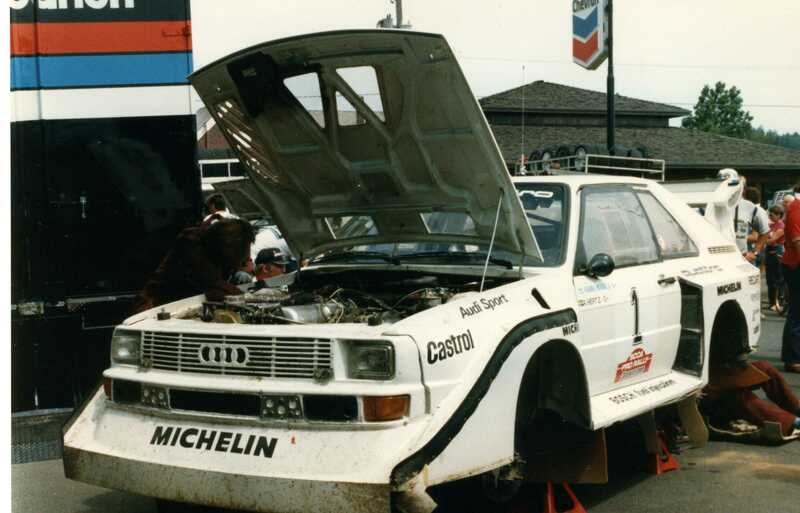 John Buffum’s long time mechanic “Salty” Sottolano at work on the Quattro. 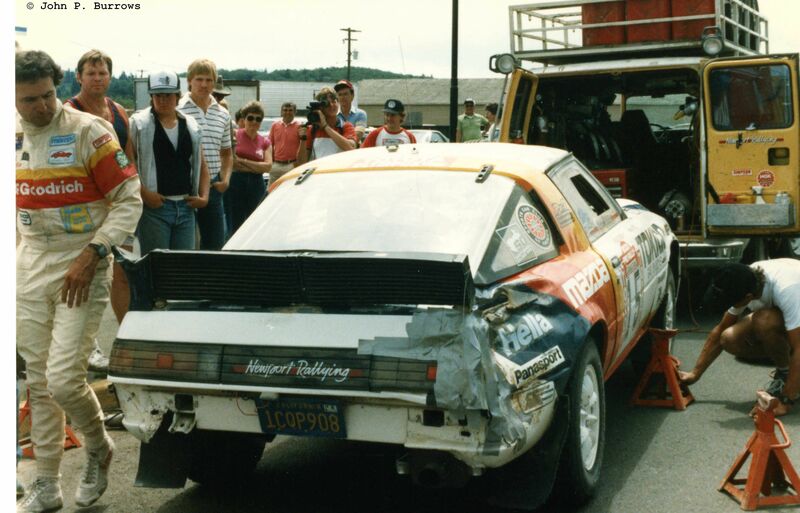 You can see the extent of the damage on Rod Millen’s RX-7 after his roll. 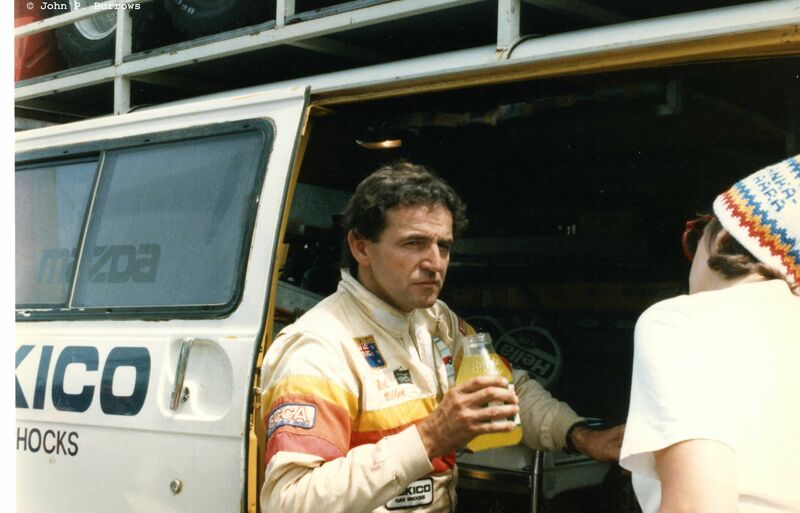 Rod needed a drink after that. 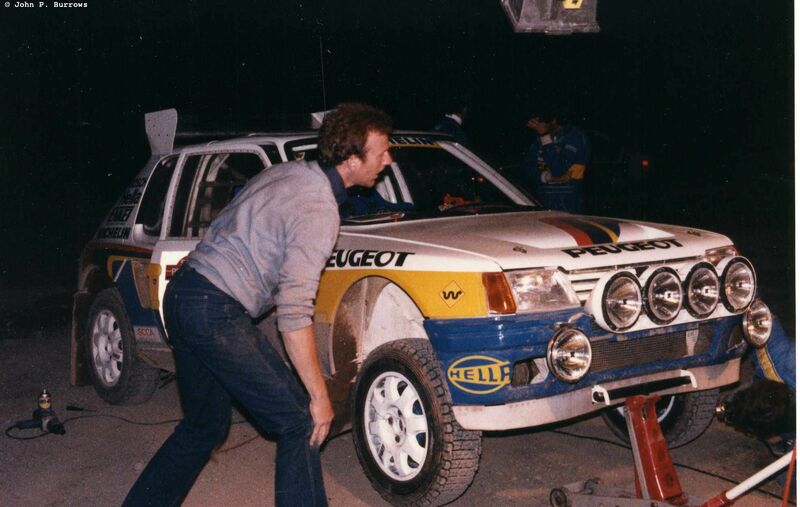 Jon Woodner did a better job at rolling his Peugeot, but was able to make it to service. 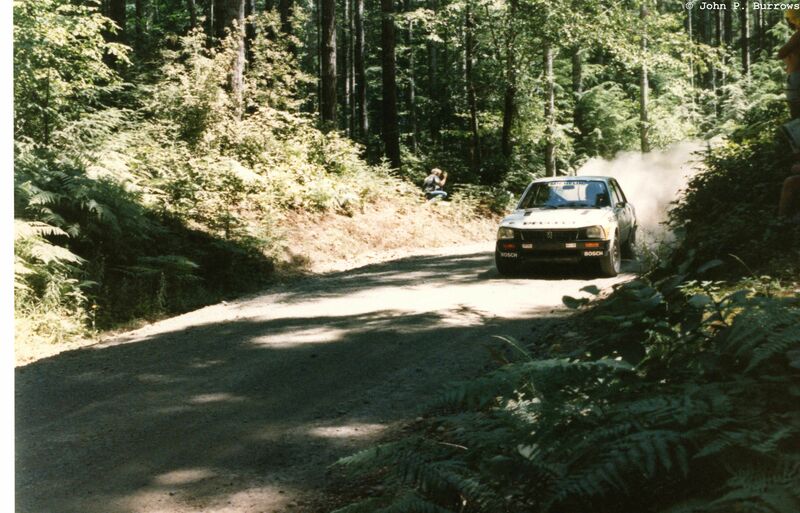 On Friday the competitors headed out to the Capitol Forest just outside of Olympia after the overnight rest halt. I had a final in the morning so I didn’t get down there until after lunch. 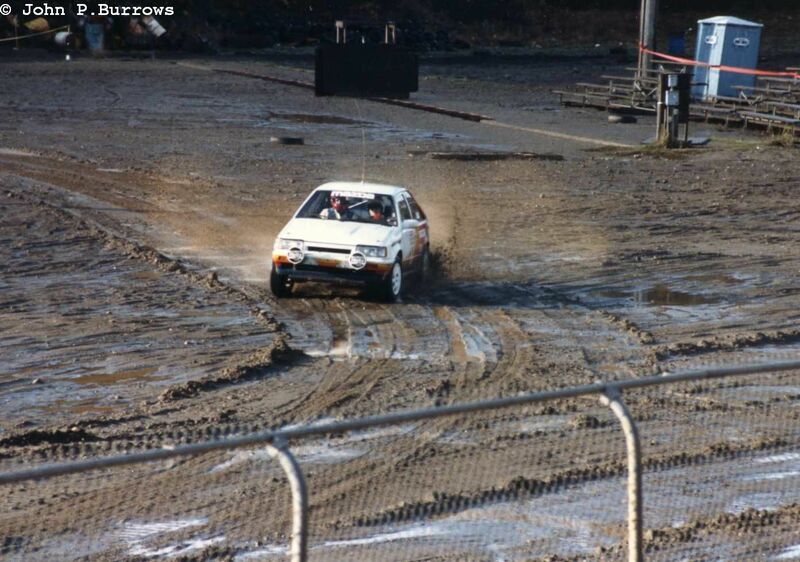 I missed the ORV Park stage with the famous water splash. You can find some footage on FaceTube of it. The day started out pretty rainy, but dried out as it progressed. 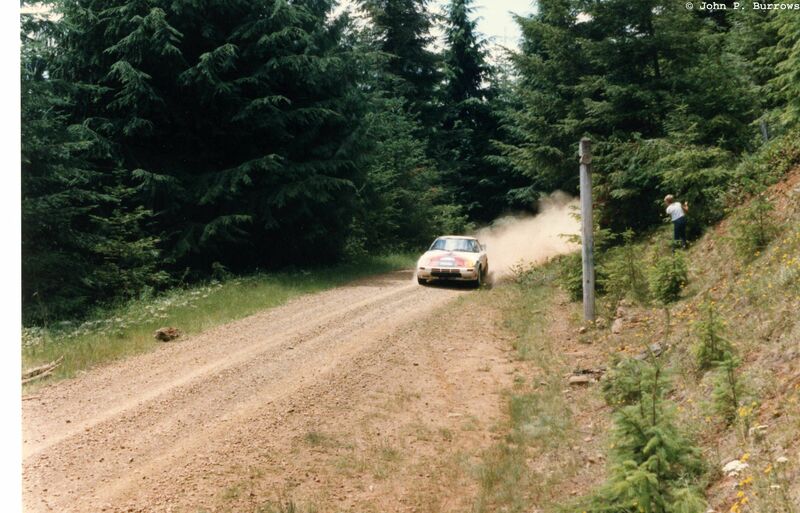 First through were the leaders Kankunnen and Alen in their private battle for the Driver’s title. 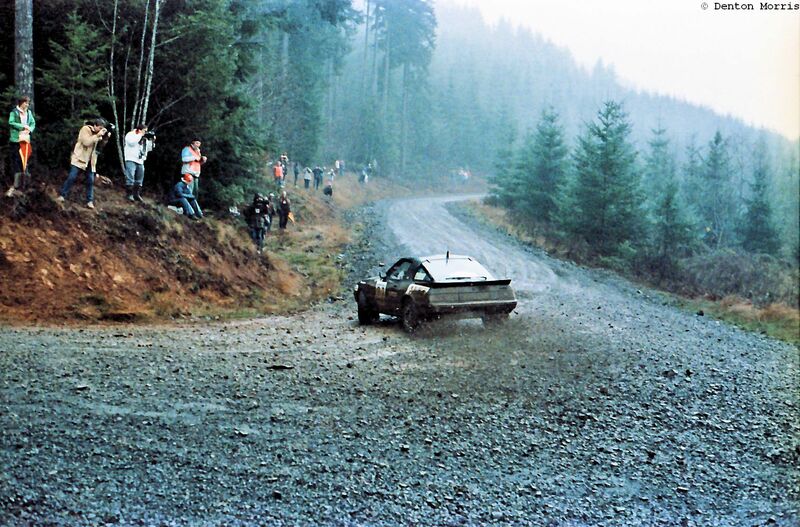 Lars Erik Torph’s TTE Celica Turbo. 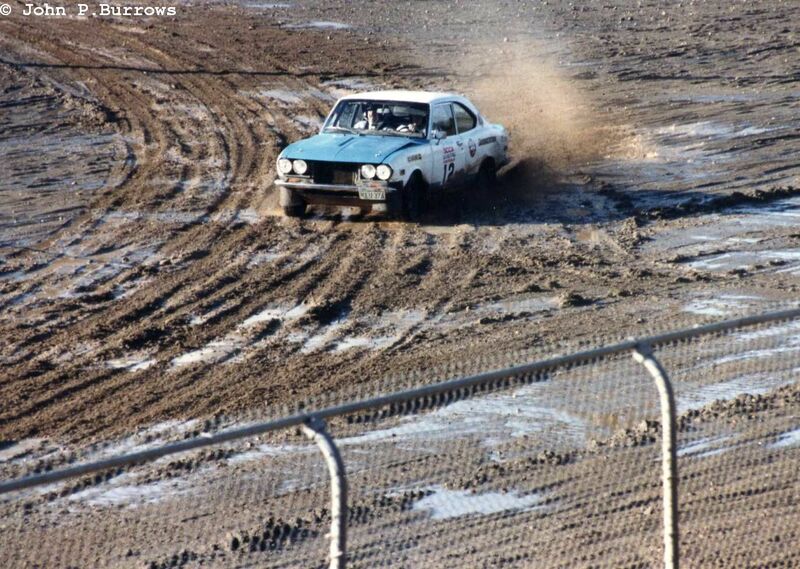 The event hadn’t been re-seeded, so Buffum was 5th on the road, but running in 3rd. 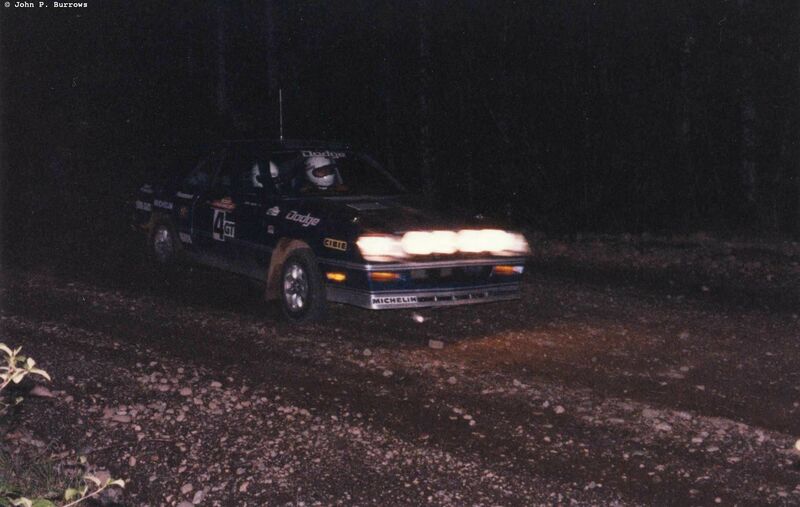 Rod Millen was soldering on in his Group A Mazda. 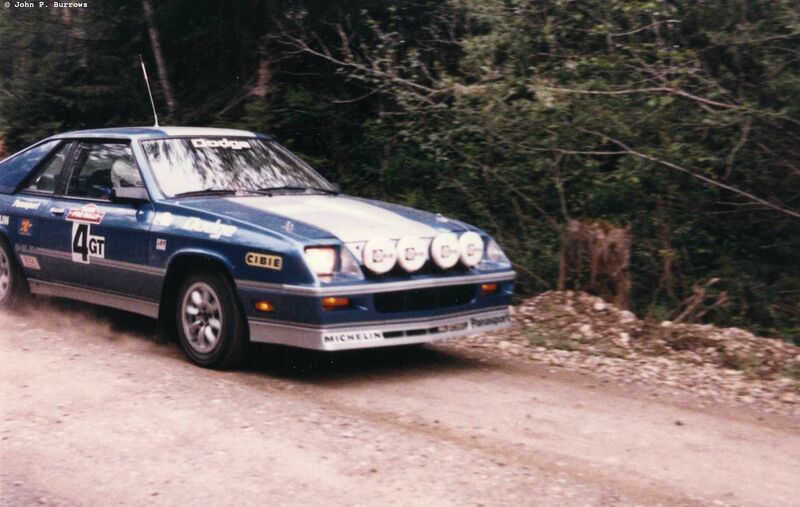 Steve Millen’s TTE entered Celica. 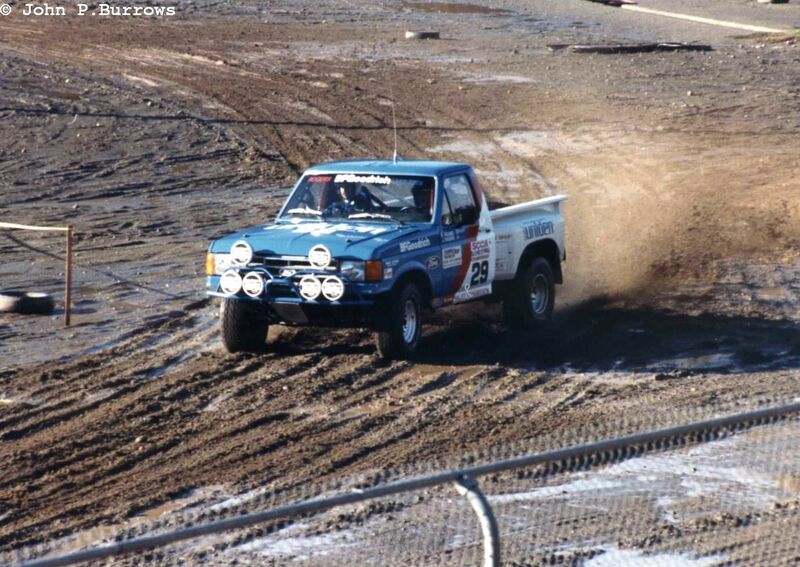 Wonder if he liked driving this better than his regular stadium truck. 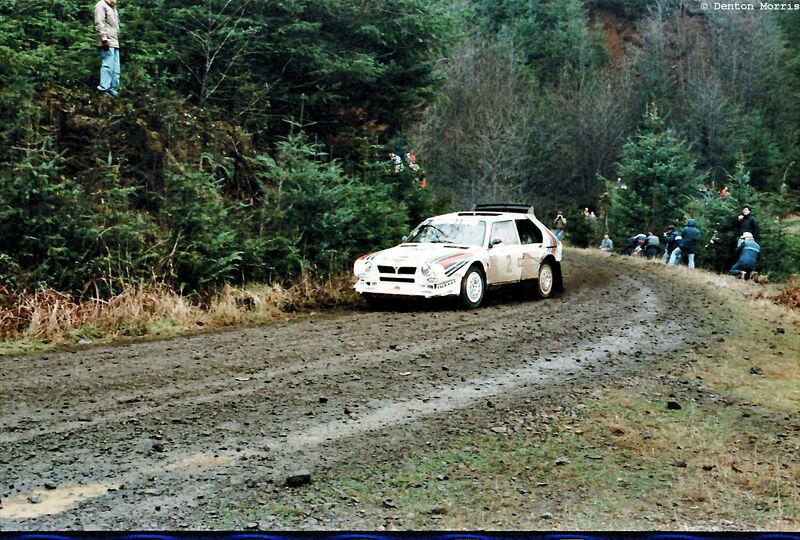 Here’s an “arty shot” of the 205 at a later stage. 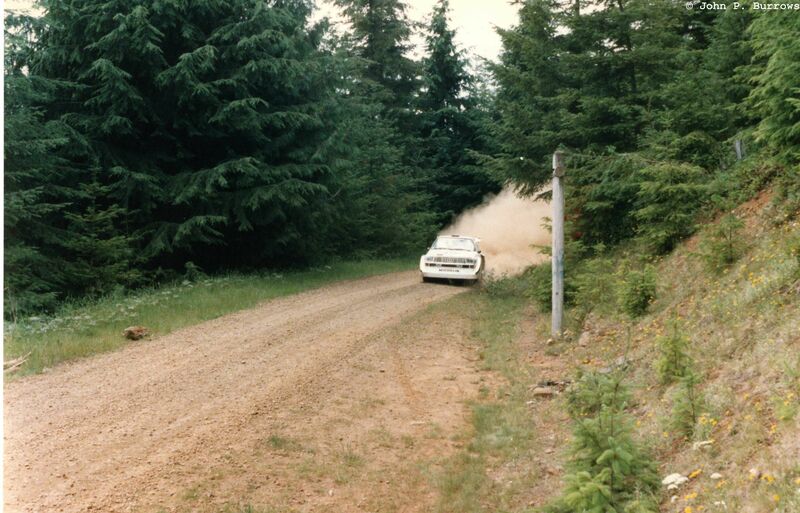 Markku in a nice drift. 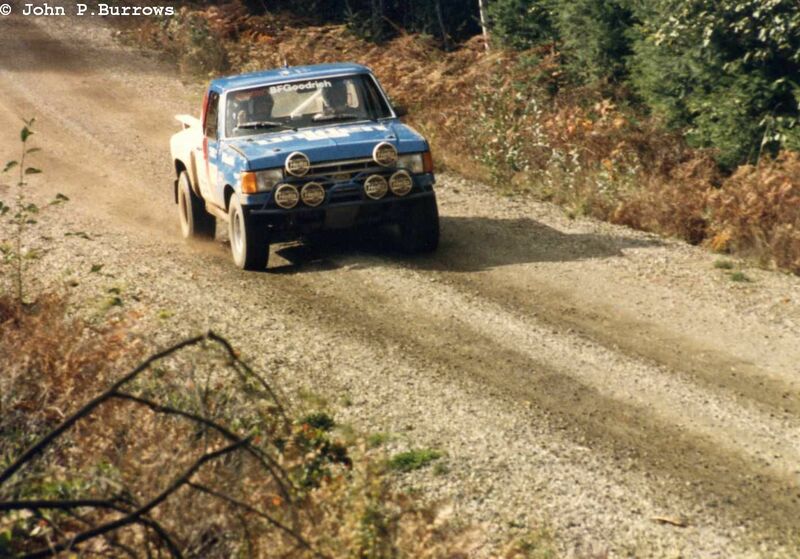 One of the Toyotas. I moved across the road from the last shot’s location after being drilled in the back by a rock from the Delta S4 after I took the last shot. 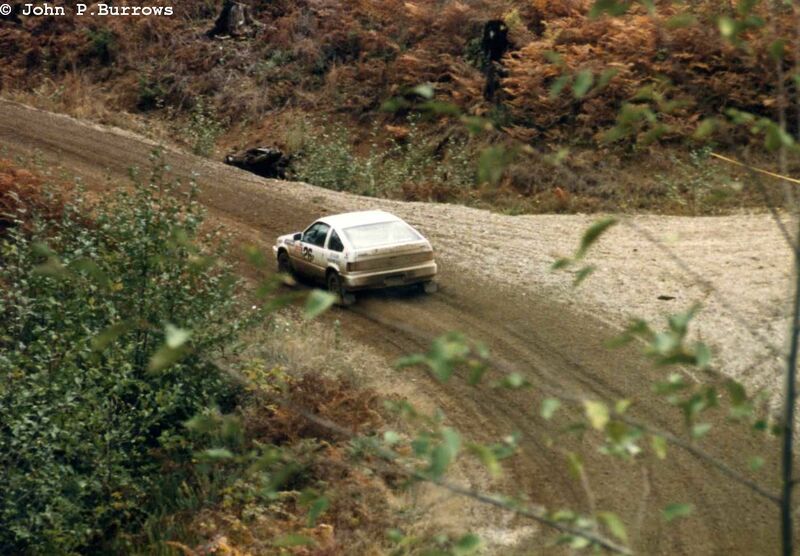 JB and the Sport Quattro, Ex-Mouton Pikes Peak.